The first step I did was to spend time thinking about lighting design. There’s a real art to this, as any interior decorator or theatrical lighting designer can tell you. 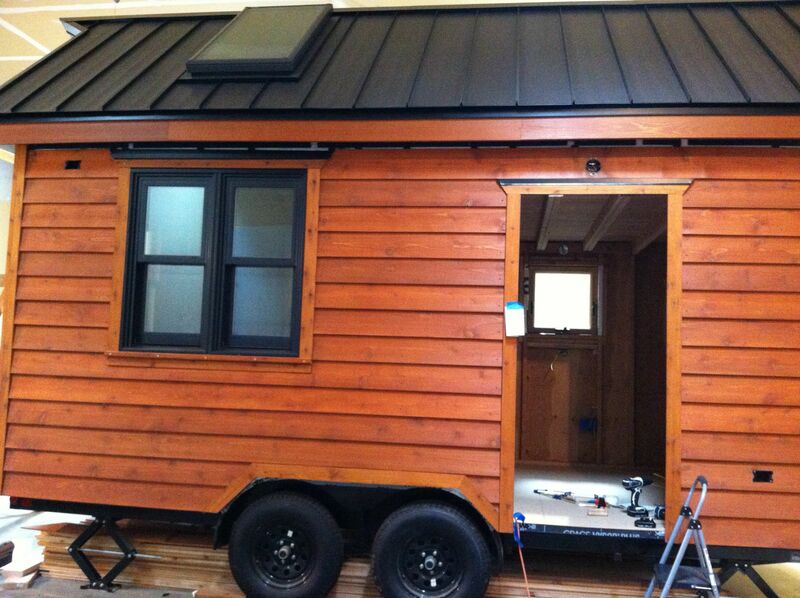 From a purely functional perspective, lighting a tiny house is easy. The space is so small that you could throw in a couple light fixtures and immediately flood the place with more than enough light to do everything you need. The art part comes in as you work out what kind of ambiance you want and figure out how to create that. This involves things like the number, type and placement of light fixtures and the wattage, type and light temperature of bulbs. The intensity, direction and color of light can radically alter a space, especially one as small as a tiny house, and affect how you feel in that space. Spend a little time playing with different lighting and see what you respond to. This is part of designing viscerally and creating a space that feels comfortable to spend time in, despite it’s small size. 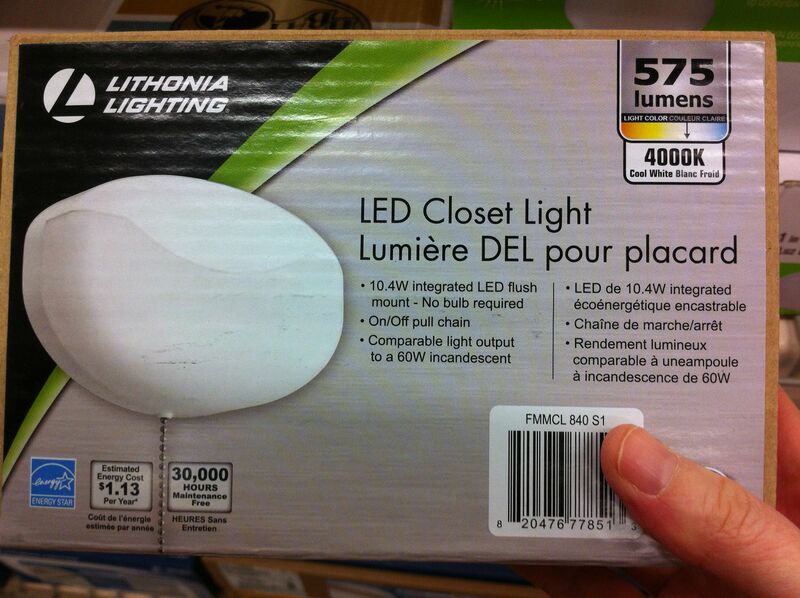 I strongly dislike overhead lights, preferring instead lamps, task lights, and indirect-light sconces. I want to have multiple lighting alternatives in the house. Providing variety in lighting options can make a tiny house more visually interesting and give the illusion of a multitude of different spaces, rather than having just the same old one or two rooms constantly in view in the same way. Shadows and dark areas are just as important to consider as lit ones for creating this sense of different spaces (i.e., turning on various lamps or task lights at different times and in different combinations will create multiple unique pools of light and darkness and alter your experience of the space). Ideally I’d have every light on a dimmer for ultimate control and diversity. Warm light is extremely important to me and so fixture and bulb selection was governed by the type of light temperature emitted by the bulb or by having a light fixture and/or shade that warms the light. Somewhat in conflict with number 3, is a desire to primarily use LED bulbs for energy efficiency and low power usage. Fortunately the technology is getting better with offering warmer visible light bulbs. 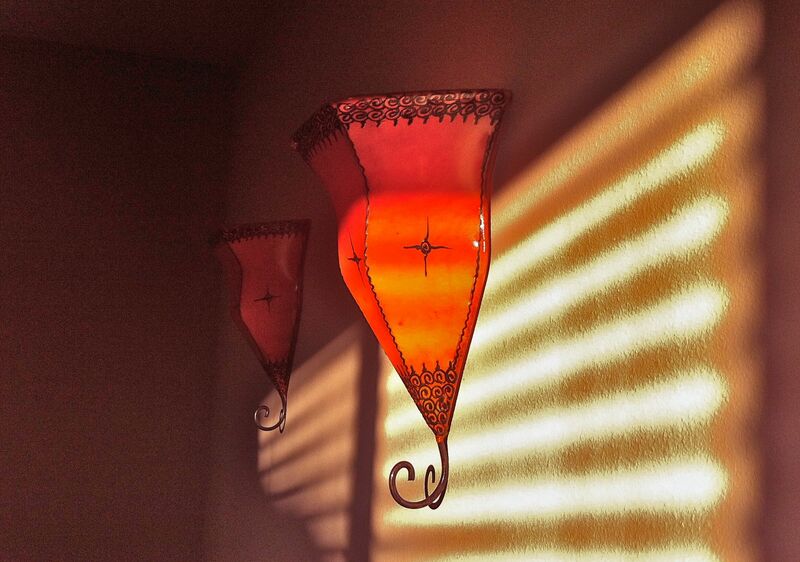 I’m also really sensitive to light flicker, which ruled out some types of lights and bulbs. I wanted the light fixtures themselves to be visually interesting, and more on the funky retro side than contemporary. While I went cheap on some of my fixtures, I was willing to splurge a little on others since in a tiny space, with little room for displaying art, the fixtures themselves should be little sculptures in my book. I ended up with an extremely eclectic variety of fixtures, which may or may not work together in a small space. An argument could be made for visual consistency, but I decided I preferred to be governed by whimsy and that it would somehow all just work since I was the one who had chosen everything. We shall see. I wanted some wall-mounted lights for practical space-saving purposes, but also wanted to have table lamps in a few places to make it feel more like a home and less like a rented RV. Where I do plan to have table lamps, I designed the built-in furniture in a way to hide both the cords and the outlets to reduce visual clutter. Similarly, with wall space at a premium, I wanted to keep the number of visible wall switches and outlets to a minimum. Several of my lights were selected because they have built-in switches or pull chains. Alternatively, you can get two, or even three, stacked switches in in the space of a normal switch plate if you want to conserve space and don’t mind smaller toggles. Also, despite having minimal gadgets, I wanted plenty of outlets in convenient places (that seems to be one of the biggest regrets I’ve heard from tiny housers). 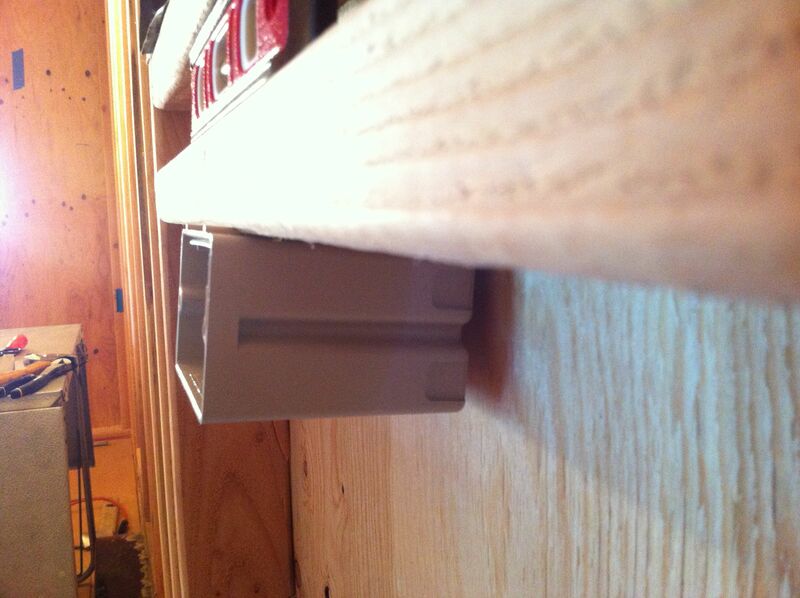 Wherever possible, I came up with ways to make them fairly unobtrusive like hiding them within built-ins. So that is my list, which hopefully will spark some ideas for you and help you figure out what is important to you. There are probably more aspects to consider if you spend time researching lighting design. Or you can just go with your intuition like I did. Getting it down on paper. I did a crash course on general wiring principles (many hours surfing the web and watching endless youtube videos). I figured out what key questions specific to tiny houses I had to research to make final decisions on wiring my house. 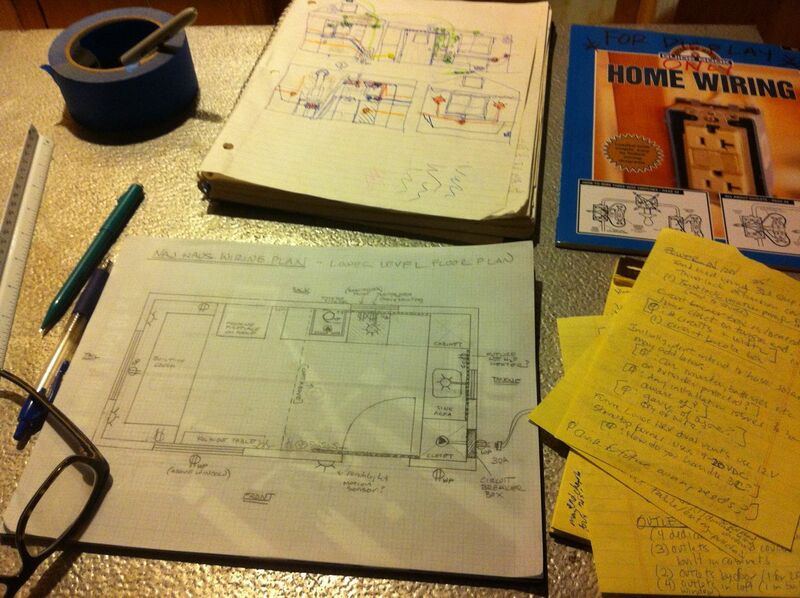 I went back to my framing plans and floor layout to start figuring out where everything was going to go. Only after I had done all this did I start to think about the specific circuits (see next section). I’ve listed other links throughout the post but here are a couple that have overviews of the entire wiring process for background; otherwise, get surfing and find your own! Where might you want a 3-way switch? 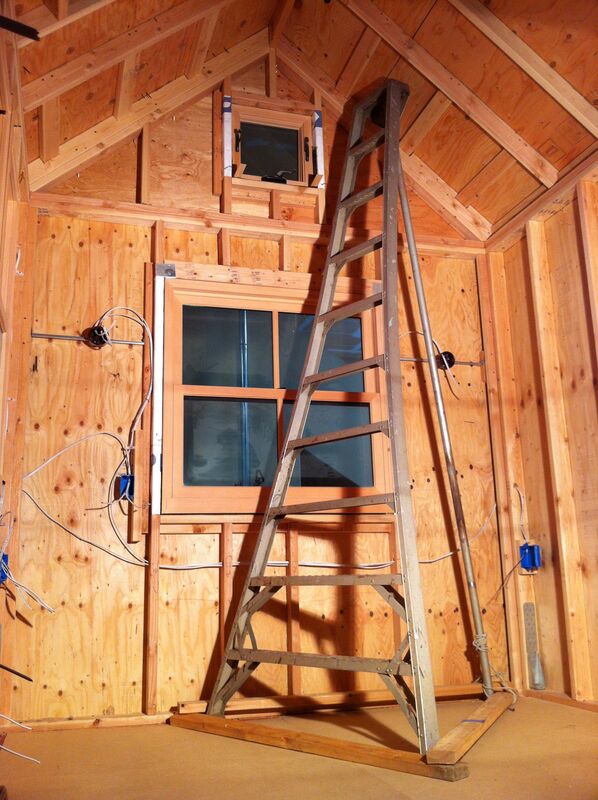 Typically if you have a loft, you’ll want to be able to turn a light on and off from both the loft and downstairs. This will require a different type of wiring so you’ll need to plan it into your circuit diagram. You will likely have certain outlets that will need a dedicated circuit because they will have high power loads. For instance, an outlet on a kitchen counter that will be used by a toaster oven, microwave, or coffee maker; or an outlet for a hot water heater, oven, or washing machine. These will also likely require higher amperage circuit breakers and different gauge cables. If you haven’t already, this is a good time to calculate out the power demands of all the gadgets and appliances you intend to have in your tiny house. A Kill-O-Watt meter is handy to have if the wattage isn’t listed on the appliance. I discovered in Oregon (and maybe elsewhere) you can check these out from your county library – very cool! A 30 amp, 125V power cord for a tiny house. Be sure to know how long a cord you will need (efficiency drops the longer it is) and that the type of plug is compatible with the receptacle you are plugging into. Also be sure to get a cord with a locking mechanism so it won’t slip out. Some cords have a pistol grip-style, right angled end so that the cord will drop straight down from where it attaches to your house. Going solar-powered is a whole subset of research in itself. If you are committed to being entirely off-grid, you can wire your house entirely 12V but you will need to adapt all of your appliances and gadgets to work on low voltage. This is the most efficient option. For most people, it makes more sense to wire your house traditionally (110V) and if you add solar capabilities, you also add an inverter to convert the voltage. There is some efficiency lost, but this is usually outweighed by the convenience of not having to adapt your existing gadgets. Note that unless you plan on having large panel and battery arrays, you will likely still need to modify your power usage and reduce your dependence on any power-intensive appliances. The nice thing is that if you go with the second option, you can add solar at any time. Knowing I could plug into the grid at my initial parking site, I opted to wait on adding solar until I really need it, at which point the technology will likely be better and cheaper. Think about what you want on the exterior of your house in terms of porch light, motion detectors, and outlets. 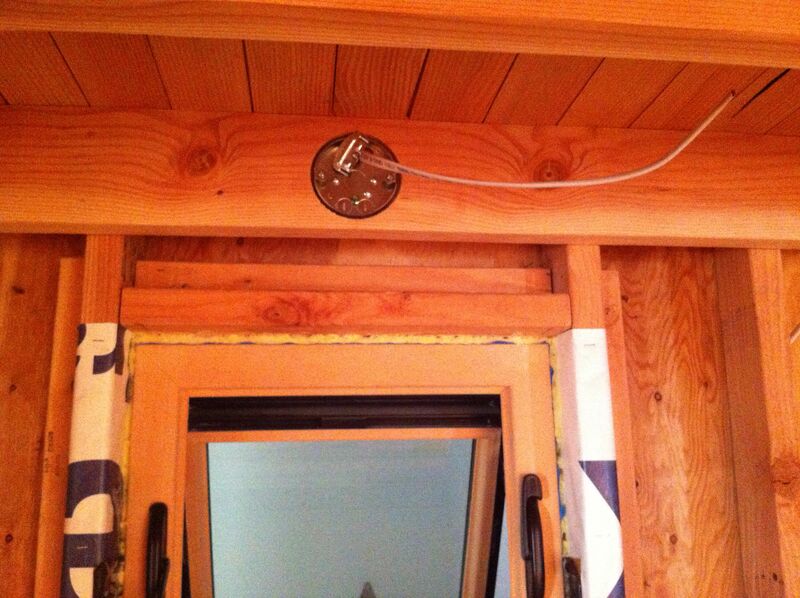 I put one outlet near the roofline so I can put up string lights that I can control from a switch inside. I also put a 20 amp receptacle (on its own circuit) in the porch area since I may have an outdoor kitchen where I can plug in a hot plate. I can also use it for tool use outside. 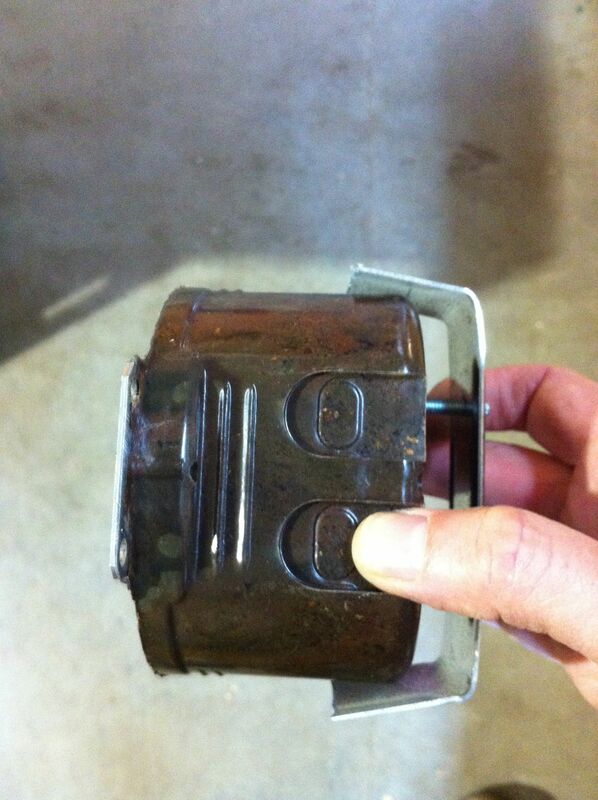 Don’t forget to factor in range hood fans and bathroom vents (very important from a moisture control standpoint! ); any ceiling fans (need to use special electrical boxes/hangers for the added weight and motion stresses); any special wiring for music, internet or other media use; and whether your smoke, carbon monoxide, and liquid propane detectors will require outlets, be hardwired, or will depend on batteries. I’m sure there’s more I’m not thinking of at the moment! To some extent, try to think what you might want in the future that you can wire for now before you close in your walls, keeping in mind there’s only so much you can reasonably plan for in the present moment since you don’t know what your needs will be in the future. For awhile I thought I might want to put in the LUNOS2 heat exchange system, but was discouraged by the cost. I contemplated putting in the wiring for it so I could easily add it later if I needed it. In the end I decided not to since there were too many unknowns and the technology would probably change. However, I did put in a dedicated outlet under my sink area in case I ever decide to add plumbing and a hot water heater. It was a simple thing to do with the added bonus is that if in the interim I find myself needing a supplementary electrical heater, I know I can use that plug without overloading another circuit. 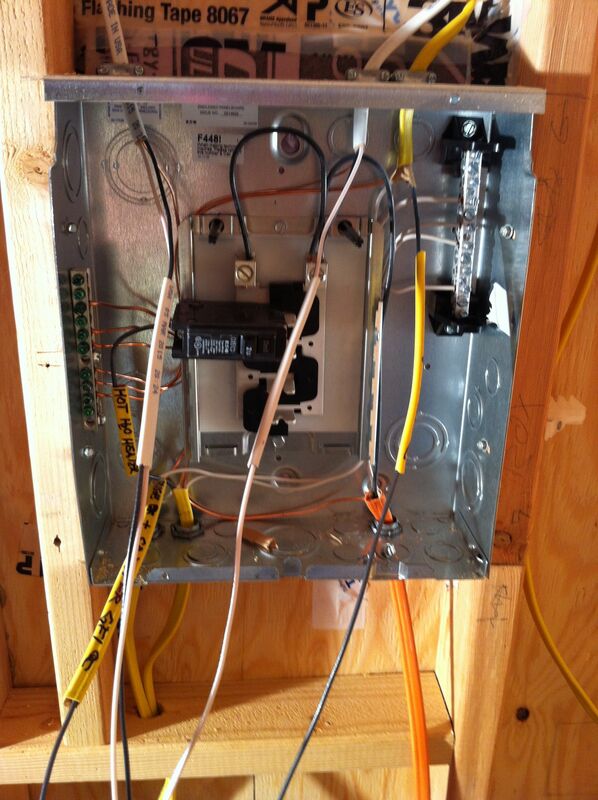 Additionally, its helpful to leave room for a couple extra circuit breakers should you need them. As I grappled with the issues above, I started putting things down on paper. I updated my framing plan elevations with the actual as-built stud placements and then put tracing paper over them to try out locations of light fixtures, switches, outlets and other details. I also did this in floor plan mode. This was helpful for spotting potential issues, visualizing what it would look like and how accessible devices would be, and for my discussions with Todd regarding circuit planning. My desire to have lots of control over my lighting options and to have lots of hidden receptacles added somewhat to the wiring complexity. As-built framing plans with an overlay of potential fixture locations. 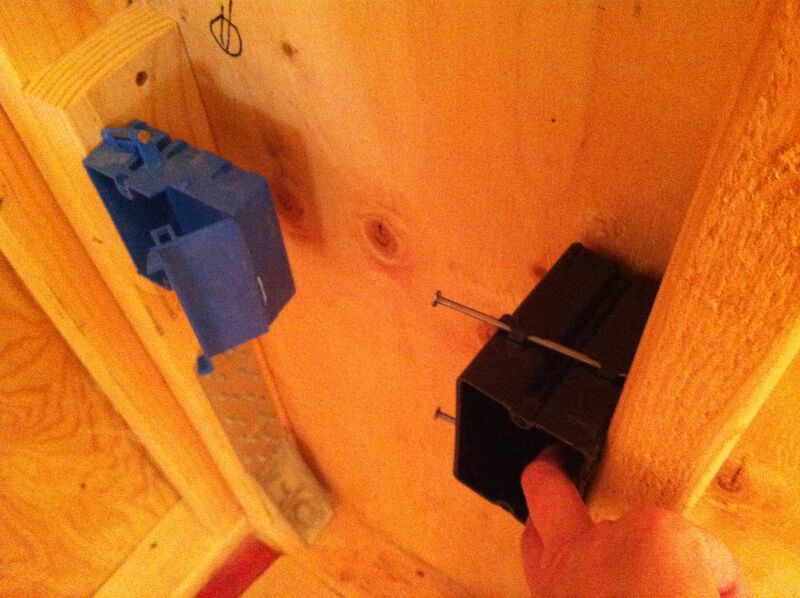 This helped me visualize where electrical boxes could be most easily placed on studs for lights, switches and outlets. 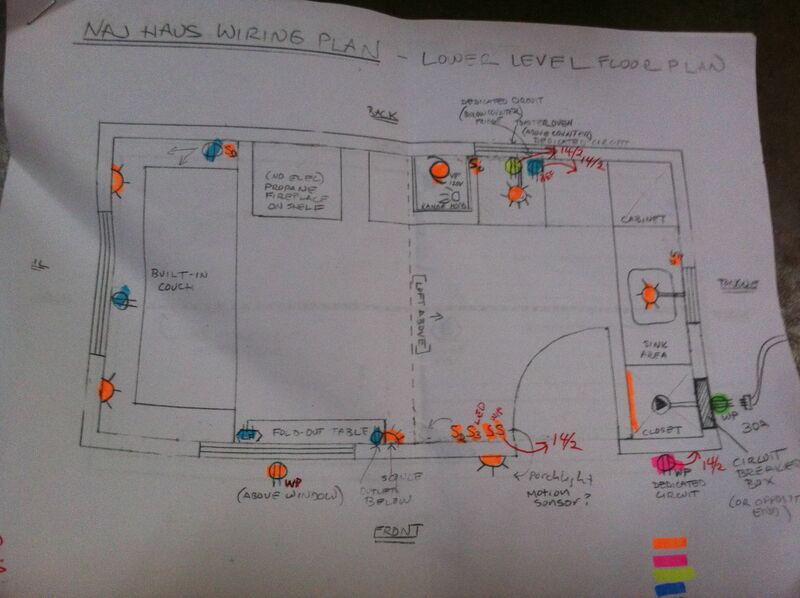 Floor plan views can help you think through how many circuits you will need and the amperage loads of each. Using colored pens for each proposed circuit is very helpful. Once you have thought through all your conceptual design ideas and figured out your power needs, it’s time to start working out your circuit diagrams. This is where the rubber meets the road in terms of actual execution. There are many different ways you can plan out your circuits. For instance, it might make sense to have your circuits correspond to locations within your house (e.g., loft, kitchen, left side, right side, etc.) so that you know intuitively what is on a particular circuit if things go south. Or you might want to plan the circuits out based on functions they are serving (e.g., lights and low-load outlets might all go on one or two circuits despite where they are located in the house). Likely it will evolve into a combined approach, with certain circuits dedicated to particular appliances. First and foremost, figure out a good circuit layout so you won’t overload any one circuit. Secondly, look at it from a wiring perspective and try to come up with the most efficient way to run the wires and connect the device boxes. You don’t want to have too many cables going through the same hole in a stud; how many depends on local code, the gauge of the wires, and how much load you anticipate running along the wires (i.e., how hot they will get). You will also need to understand how the devices and fixtures will actually be wired. Understand middle-of-run and end-of-run device wiring and how to wire 3- or 4-way switches if you have them, and any master/slave dimmer situations you might have. Know what gauge wire cables you will need for different appliances. Will you need low voltage wire and a transformer anywhere? Will you be using conduit? Do you understand the concept of circuits: how the hot, neutral, and ground wires connect to create a safe, complete loop? Since the electrical code is meant for traditional houses, you will need to decide how much you want to comply in terms of number, spacing, location and height of switches and receptacles. It’s a good place to start but might not make sense in your amount of space. As long as you understand about not overloading circuits, you should be okay. I went through several iterations of diagrams as I became more conversant in how many devices can be connected, box fill capacities, etc. Todd was great in pointing out elegant solutions for streamlining the wiring. Use both wall elevations and circuit diagrams. 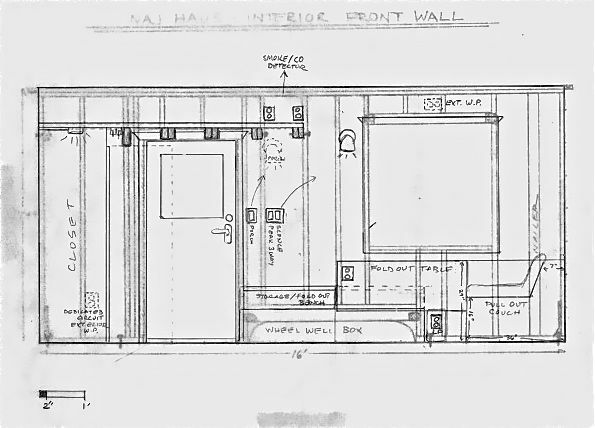 The wall elevations help you see what you will encounter in reality and the circuit diagrams help you spot places you might have too many wires coming into a box, exceeding capacity and thus where you might need either bigger boxes or junction boxes (see below). 20 amp circuit for a dedicated exterior GFCI outlet that I may use when I want to cook outside (hot plate) or to plug tools into. 20 amp circuit for a dedicated interior GFCI outlet under the sink for a future hot water heater or just as an extra plug for heavier load items. 20 amp circuit for a kitchen counter GFCI outlet and the compact refrigerator (I may regret not having these on separate circuits but I was assured it would be fine. If not, I can plug the fridge into the spare outlet nearby). 15 amp circuit for the other half of the house lights and receptacles (also low low load). The two 15 amp circuits don’t correspond to particular parts of the house but evolved as I figured out the most efficient way of wiring them. 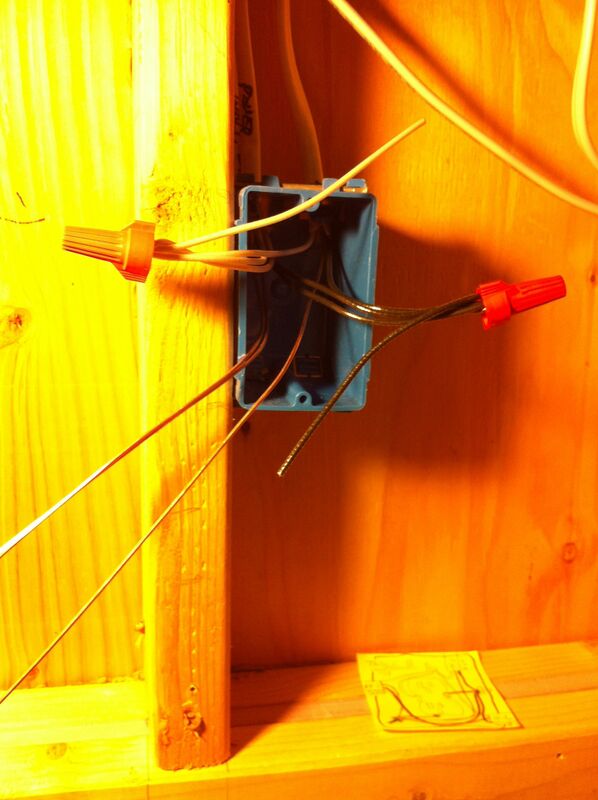 I ended up putting in two junction boxes so I wouldn’t have to add additional circuits (see below). I used 14 gauge wire for the 15 amp circuits and 12 gauge wire for the 20 amp circuits. Know what the difference is between 14/2 wire and 14/3 wire and where you would use each. Be sure to get cable with ground wires in it. While technically you don’t need to have all your light fixtures, switches, outlets, and appliances on hand at the rough-in stage, I highly recommend it. There were many times I needed to know if light bases and devices would fit with selected device boxes, where to locate wires precisely (particularly for the range hood), and if there are any special wiring considerations. 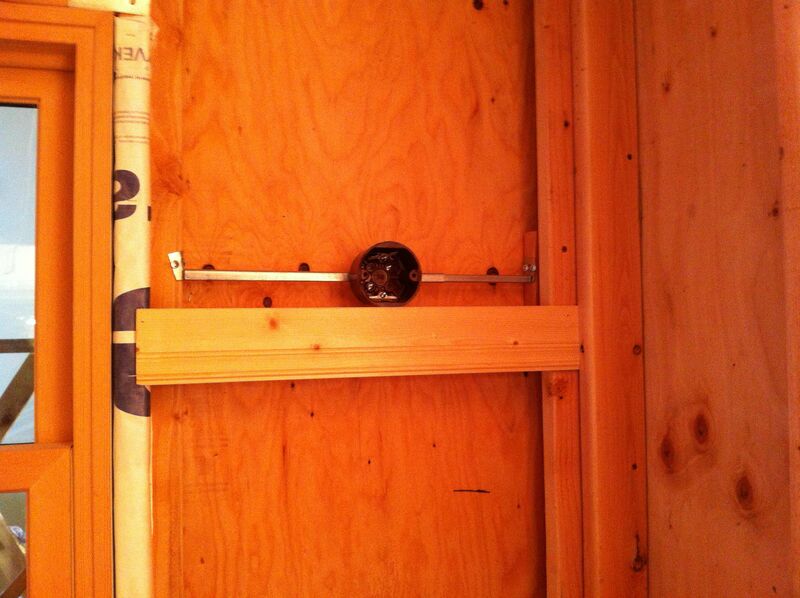 You may need to put in special framing for your range and bathroom vents. This was the closet light I ended up with since it was very efficient, small size, did not require a separate switch, and can be mounted in various ways. However, it was challenging knowing precisely where to have the wire come out of the wall since the closet hasn’t been built yet! 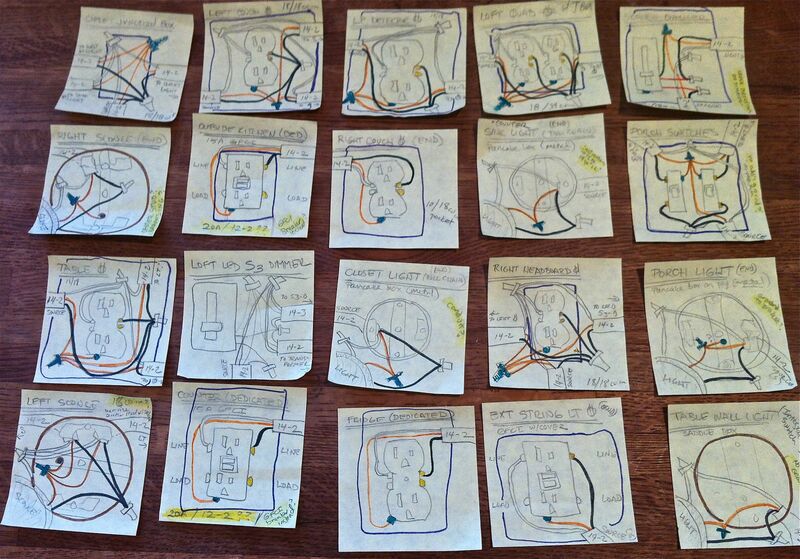 I admit it was a little obsessive but I made a diagram on a post-it for every device and fixture. It was really helpful for learning about wiring end-run and middle-run devices and working out trickier situations. I appreciated these little guys when I was making up my boxes (below). As you work through your circuit diagramming, you may find that you need to give up on some of your design requirements for ease of installation. For instance, since I wanted minimal switches, I gave up on being able to dim a few of my lights or found ones with built-in dimmers. I also had this fabulous plan to put an LED tape light along the peak of my roof, hidden by a suspended piece if trim so that indirect light spilled out each side of the peak. I was going to control it by a 3-way switch on a master/slave dimmer upstairs and downstairs. I thought it would create amazing ambiance. 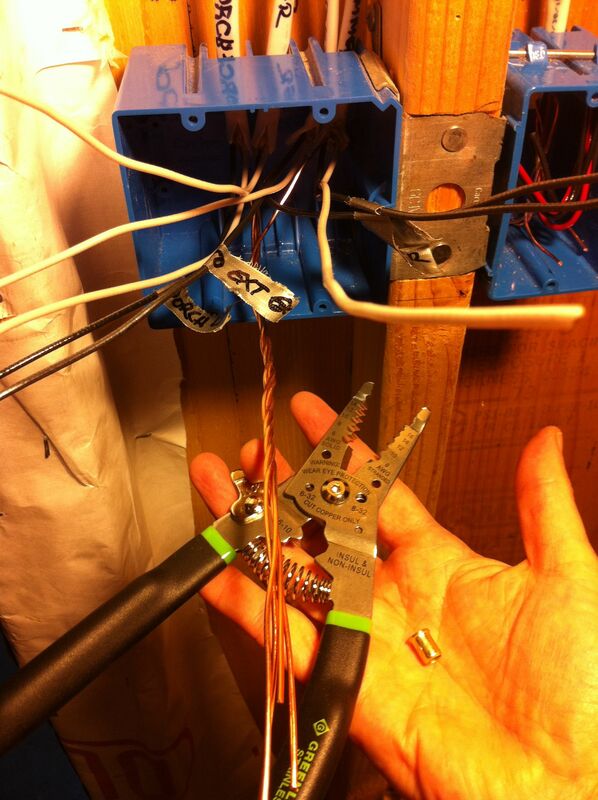 I went so far as to wire in the low voltage wire and transformer before testing it and deciding I hated it! 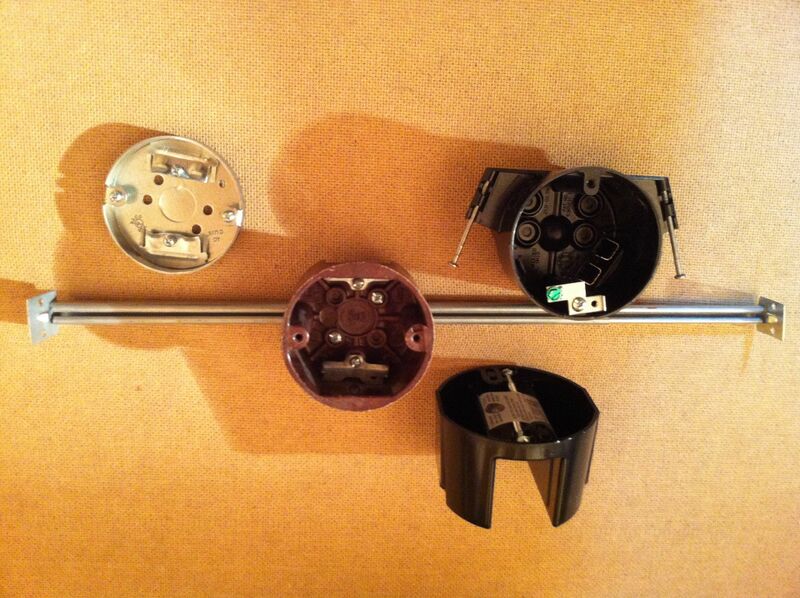 I was very happy to spare myself all the complex wiring and instead bought a cool retro loft light. Lesson: simple is generally better. It looks kind of good here but wasn’t what I wanted when I tested it out. The spoils of my first trip to the electrical supply store, one of many. Tip: some of the stores, like Platt Electric that cater to professional electricians, only sell cable and other supplies in large amounts (like 250′ rolls). This can be great at the beginning but if you run short and just need another 10-15′, places like Home Depot sell in smaller quantities. My local hardware store even sells cable by the foot. 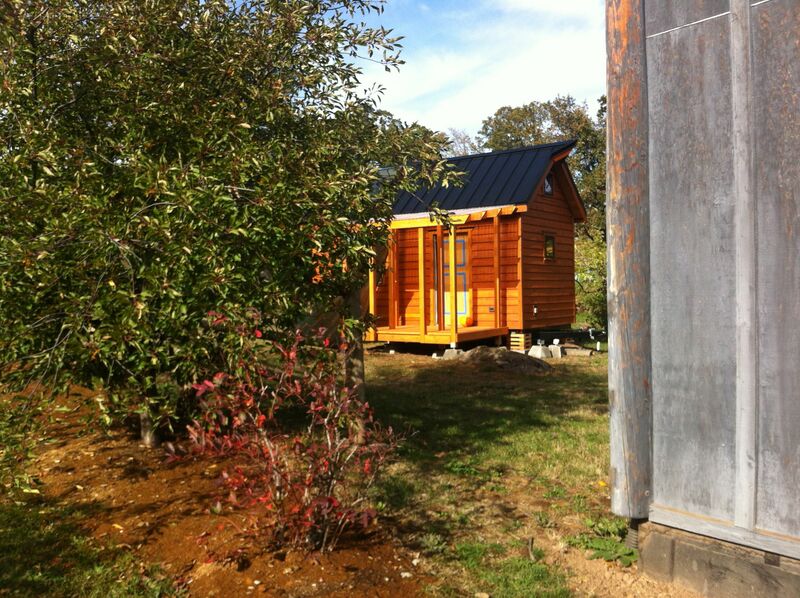 The majority of tiny houses are constructed with 2×4 studs rather than the more standard 2x6s used in traditional construction in order to reduce weight and increase interior space. 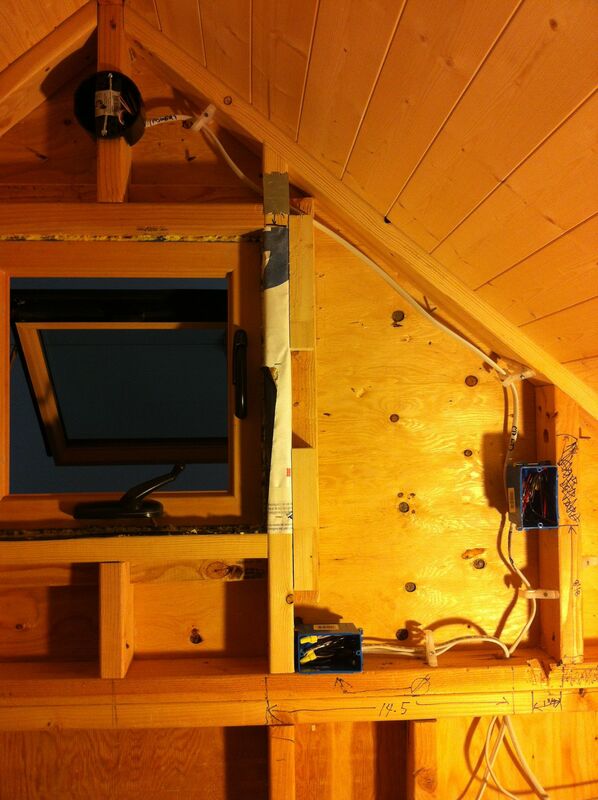 This can present some challenges when it comes time to wire your tiny house. Since most electrical supplies are made for traditional construction, standard breaker boxes and device boxes (for switches and outlets) will be up against the sheathing when installed. 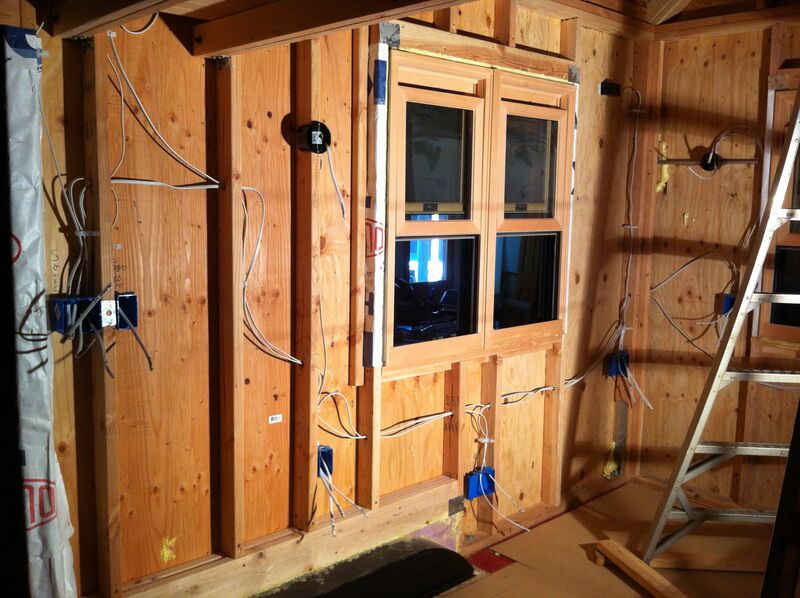 Since there isn’t room for insulation between the boxes and the wall, cold air can easily transfer into the house. While this can be a bit of an energy efficiency hit, a bigger concern is that warm moist air on the interior can potentially condense on the inside of the box and cause problems, particularly if you have moisture control issues due to poorly vented kitchens and bathrooms. If at all possible, it’s good to create even a small thermal break between the sheathing and the box by separating them slightly and filling the gap with insulation. It may not be a significant issue, particularly in my situation, but I decided to be safe than sorry. Below you can see how I installed my breaker box. 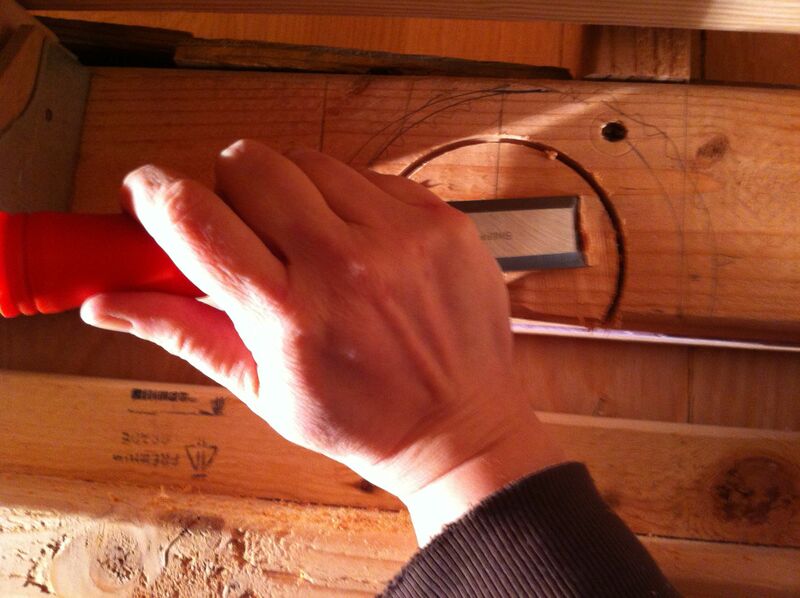 First I taped a piece of rigid foam board insulation to the interior sheathing. Then I added some framing to secure the box and screwed in the box to the framing, tightly sandwiching the rigid foam board. This caused the breaker box to extend out a bit from my finished paneling (see last photo), but I will trim out around it to make it less apparent. Note: For all the photo galleries below, you can click on one and see a slideshow with larger pictures and captions. 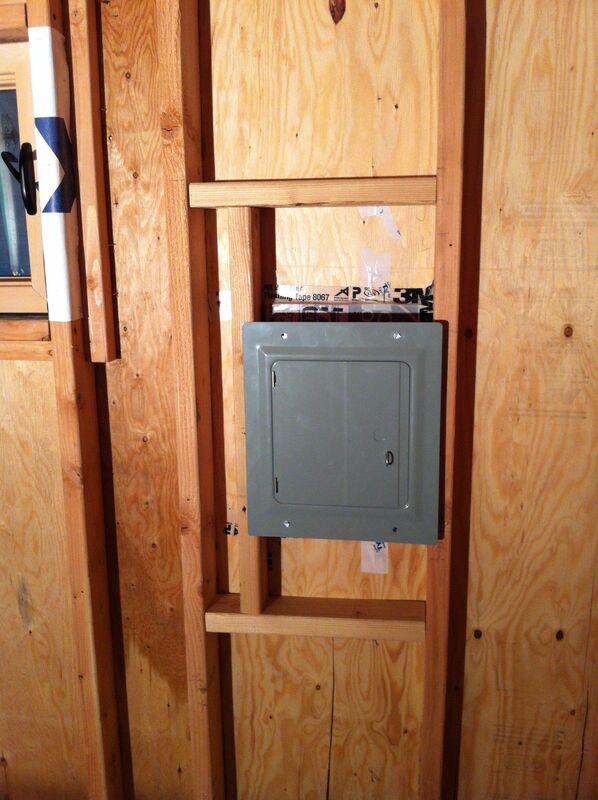 Breaker box installed with added framing. The interior of the breaker box as the electrician was beginning to wire it. 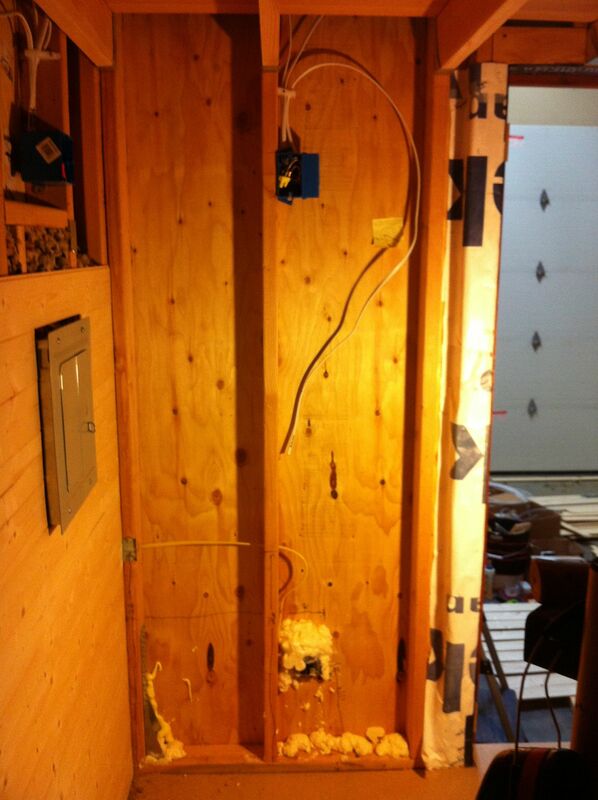 Profile view of the installed breaker box as paneling is being added. 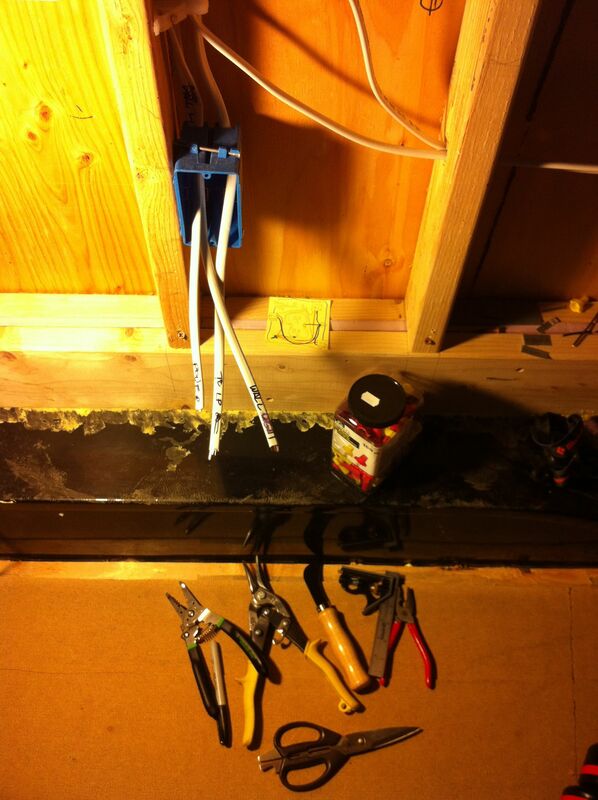 The bulk of the rough-in wiring involves installing device boxes and then running cable to connect them. While some boxes are specialized for fans or hanging lights, the majority are generically used for either switches and/or outlets (receptacles). I was completely overwhelmed at first by the endless sizes and choices out there. Fortunately I’m going to lay it all out for you so you can be a little more suave at the electrical store than I was. First thing to be aware of is that boxes are broken down into old work and new work. Old work boxes are for when you’re adding a box to an finished house, having to break through already-installed wall board. Old work boxes tend to have little wings and flaps to help secure them in the wall since you may not have access to nail into a stud. For the most part you can ignore old work boxes, though you might need them when you are installing exterior boxes through your siding (see below). New work boxes are often, but not always, blue plastic (see the Carlon catalog for lots of helpful information). The benefit to plastic boxes versus metal ones is that you don’t need to ground them and they often have built-in cable clamps that don’t take up much space. But you may need to use metal boxes in certain cases. If you do, be absolutely sure you understand how to ground them properly so you don’t accidentally get electrocuted! New work boxes also vary in how they attach to framing (see below). Device boxes can also be one-gang (or single-pole) or larger. One-gang boxes hold one device like a light switch or an outlet, though, as mentioned above, you can get switch devices that have two or three switches stacked on a single pole, or a switch and a single outlet stacked. Two-gang (or quad) boxes hold two poles for side-by-side switches or outlets, and you can get larger boxes for additional poles if you need them. While one-gang boxes are roughly the same width and height, they vary significantly in terms of depth. This gets into two extremely important concepts that I haven’t seen discussed much in the tiny house blogs: thermal bridging and box fill capacity. 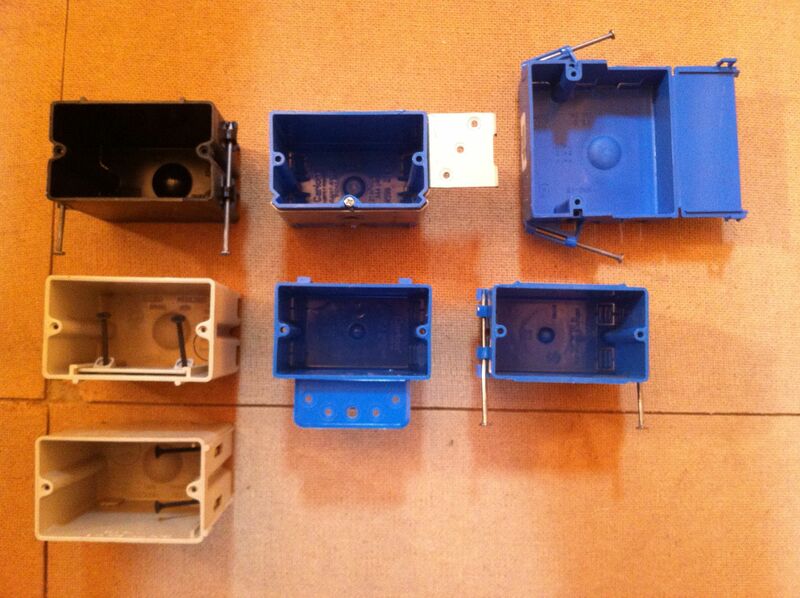 A random selection of one-gang boxes that attach in different ways. Note the similarity in terms of height and width of the opening. The box in the upper right is called a pocket box. The flap on the outer right side folds back over the middle third and is slightly recessed, leaving the standard one-gang box opening on the left third of the box. This will be more clear below. 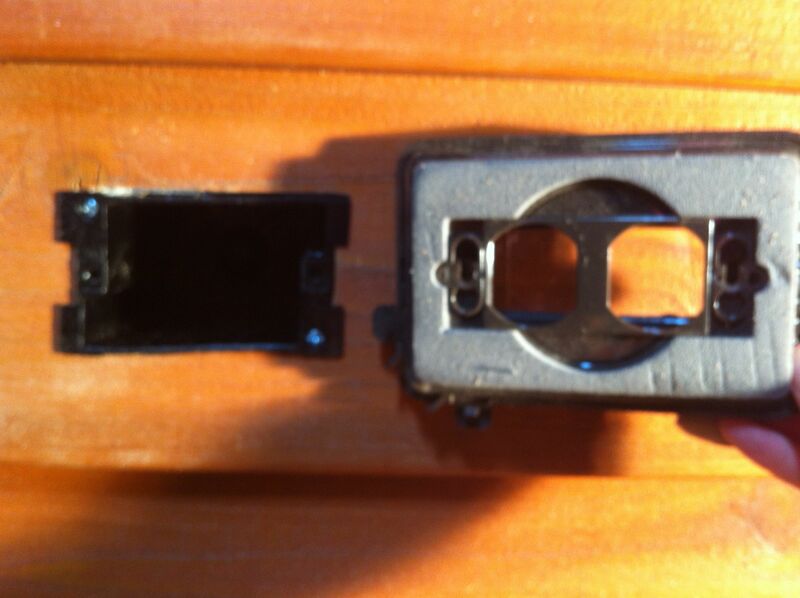 The black box on the far right is about 3.5″ deep, the same as a 2×4 stud cavity. 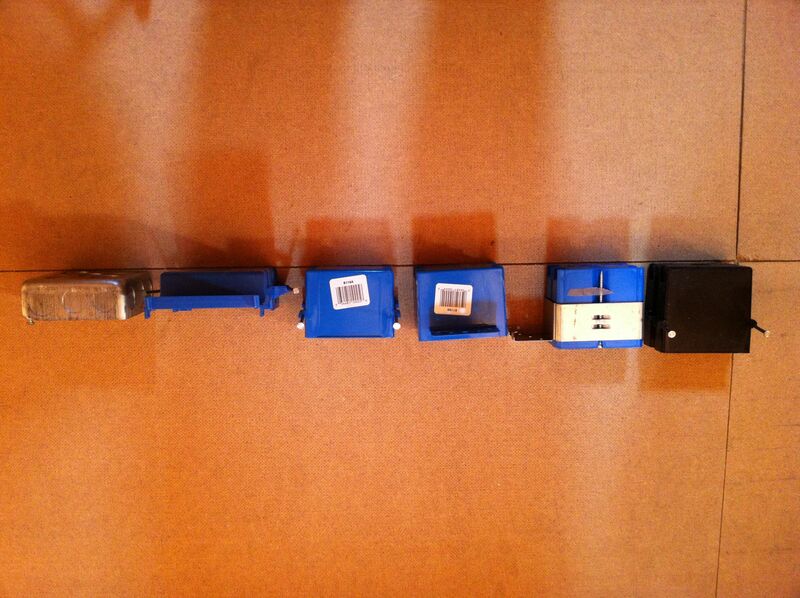 In contrast, see how shallow the pocket box is (second from the left), 1.25″ deep. 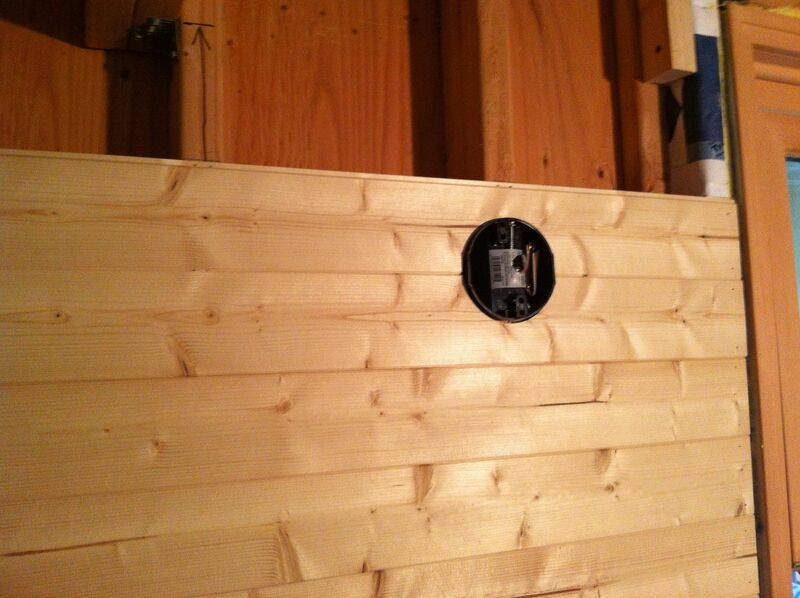 Here you can see the depth differences of the pocket box and the standard-depth black box in a 2×4 wall. You can also kind of see how the pocket box flap closes over on itself. 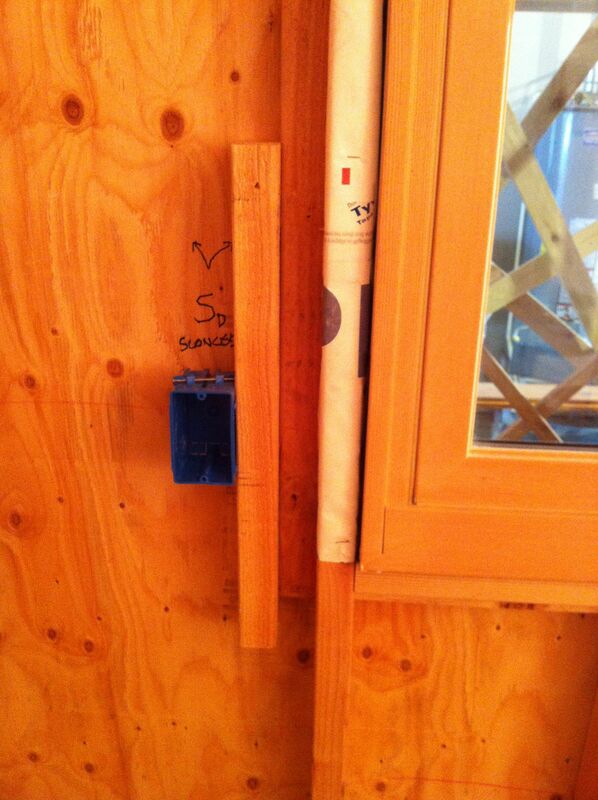 In traditional 2×6 framing, the black box above would still have a couple of inches between its back and the sheathing for insulation to create a thermal break, similar to what we discussed above with the breaker box. However, if you’re working in 2×4 framing, you won’t get that thermal break if you used device boxes like the black one since you won’t have any room for insulation behind it. 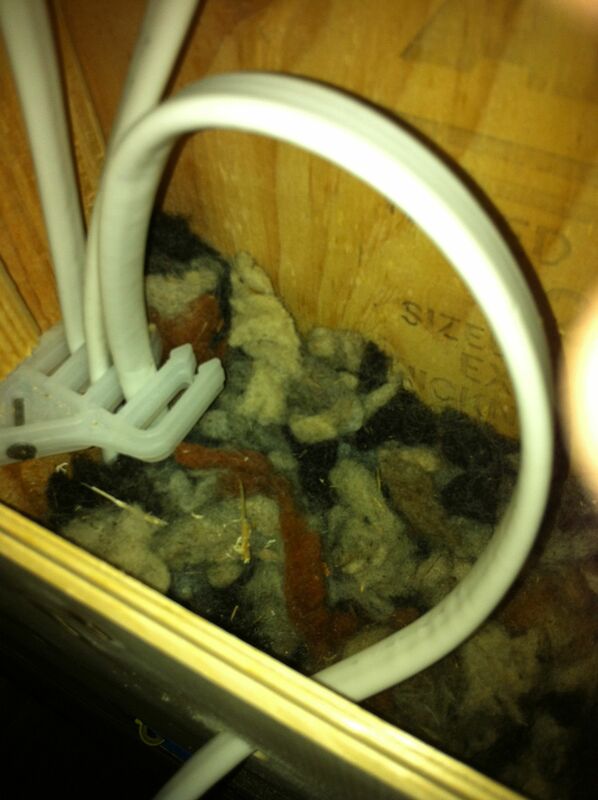 This potentially could cause problems with heat loss and condensation. So easy, just use pocket boxes everywhere, right? Unfortunately it is not that simple! Despite the clever design of the pocket to the side of the opening for housing wires, the pocket box still has less volume to hold wires and devices and clamps and wiring nuts than the black box. If you don’t have many of these, the pocket box works perfectly. If you have a lot and try to cram them all into the small space in the pocket box, you are greatly increasing your chances of shorts, sparks, fire, and, worst case, electrocution. So how do you know how much can go into a particular box and still be safe? The powers-that-be have figured this all out, but you need to understand about box fill calculations and box fill capacity. This is where you need to do some homework. Promise me that you won’t install any boxes until you fully understand the concept of box fill capacity and how to calculate it. Promise? Okay, below are some links to get you started. Basically devices, clamps, and conducting wires are assigned points and you add up how many you plan to have in a box and multiply it by a special number depending on the gauge of your wire. This gives you a total box fill amount you need to contain. Each device box has a box fill capacity amount (volume) listed inside it. As long as your planned box fill amount doesn’t exceed that maximum capacity, you can safely use that size box. If does exceed it, then you have to choose a larger box (or find an alternate solution like adding a junction box hub into your circuit – see below). What does this look like in the real world? I used pocket boxes everywhere I could, primarily at the end of runs and where I was using just a simple switch or outlet. (Keep in mind that while pocket boxes are good solutions in terms of being able to fit the most insulation behind them, they are a little trickier to tuck wires into them once the box is closed up and the wall board is installed over the pocket side.) In places where I had GFCI outlets, dimmer switches, or other devices that were more bulky than a standard switch or outlet, or where I had a larger number of cables coming into and out of a box, I would use a larger capacity box. Fortunately there are some device boxes that are between the pocket box and the black box in terms of depth. You just need to know to ask for them (see the middle boxes in the photo above). In these cases I was still able to get a little insulation between the back and the sheathing to give me a bit of a thermal break. In a couple places, I wasn’t willing to give up on the pocket boxes, so I added in junction boxes into the circuit to redirect the cable layout and reduce the box fill amounts on certain boxes. So go forth and buy your boxes, but only after you know how to size them properly. You may find yourself doing more iterations of your circuit diagrams to make it all work out and to know how many of each size box to buy. I would make notations of the box fill amount next to each box location on my diagram and then identify which size box was required. As mentioned above, there are various ways to attach device boxes. While some just nail directly in, for a couple bucks more you can get ones that can easily be moved further in or out of the wall after they are installed. While you might not want to use these everywhere, they can be particularly useful in certain cases. As you can see in the photo of the different types of boxes above, you can get boxes that attach to the framing on either the long side or the short side, depending on the situation. Open the slideshows below for more tips. 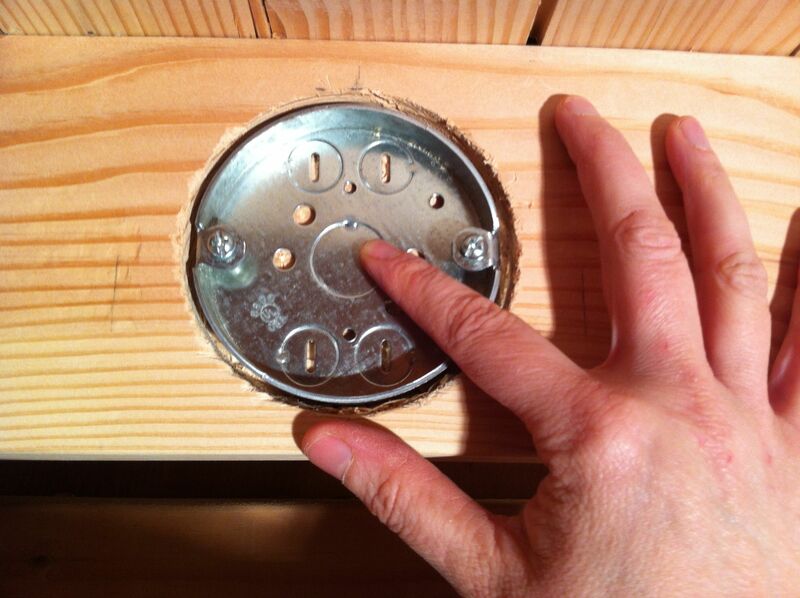 The nail-in boxes may not work in every location depending on how they are oriented. 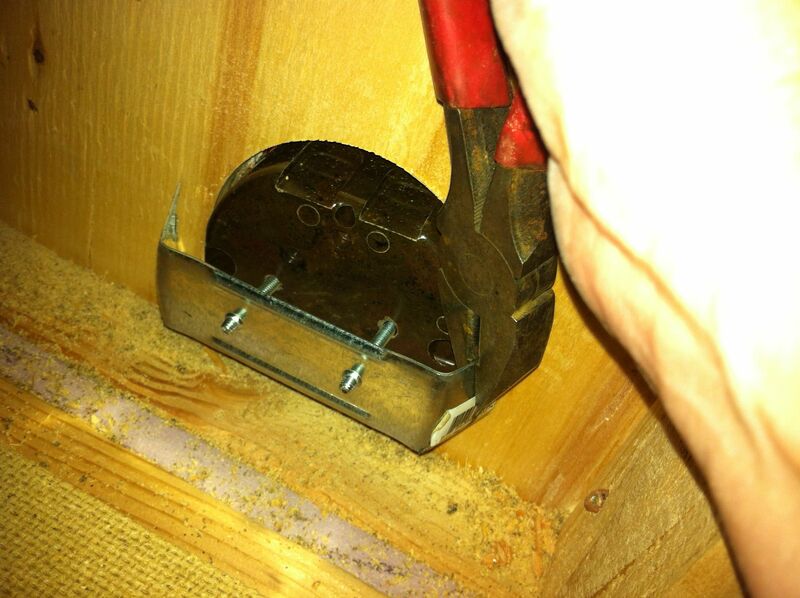 In the photo above, it was difficult to pound in the nail due to the proximity to the stud. I also found that it is harder to keep the boxes in the right alignment when you pound them in; they tended to slip back slightly into the wall so that they weren’t always as flush with my paneling as I would have liked. 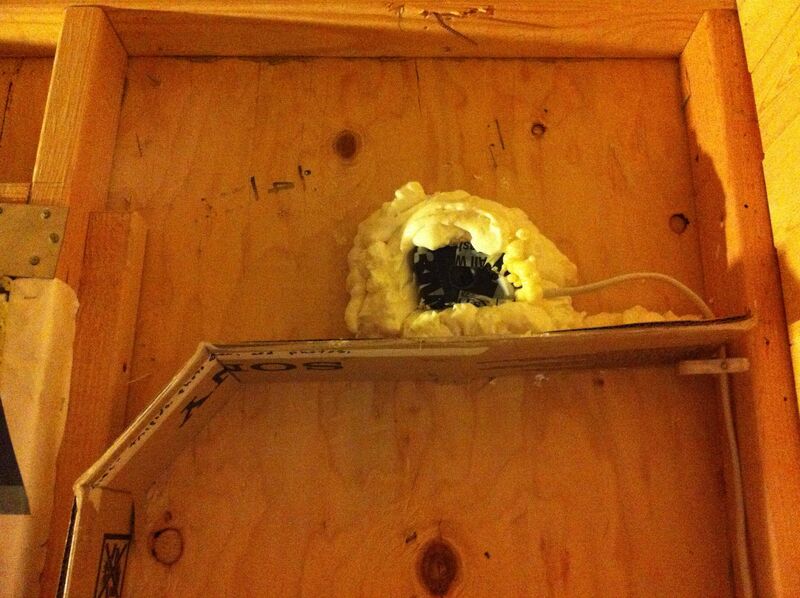 Definitely make sure you don’t have a gap that exposes the inside of the box to combustible materials around it. 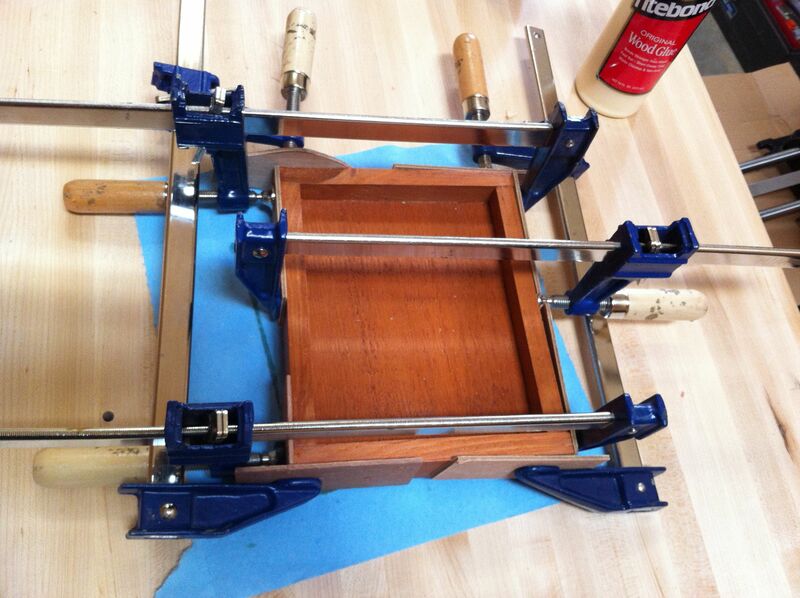 Adjustable boxes, on the other hand, can be installed first and adjusted later to the right depth. 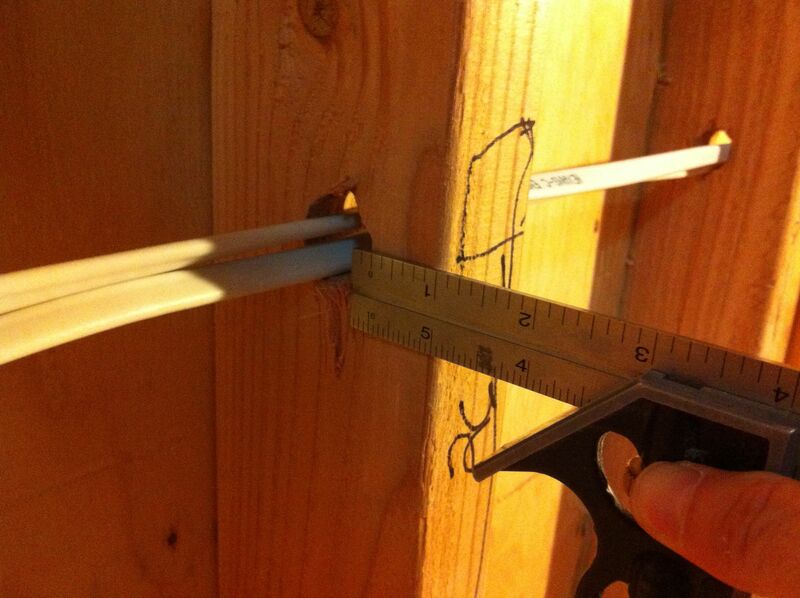 Tightening or loosening the screw means you can get an exact alignment with your paneling. Another case where adjustable boxes are very useful is when you intend to have them be embedded in your counter backsplash. Since you may not know the thickness of your backsplash at the time of wiring, an adjustable box gives you the flexibility you need. I added some additional framing to attach the outlet box to so that it would be at the right height within the backsplash. Profile shot of the box tucked into the wall. Profile shot of the box extended. It will be adjusted fully when the backsplash is installed. In general, when laying out a circuit, you daisy-chain device boxes together so that power comes into a box, supplies the device in the box, then a cable continues to the next device box, supplying it with power, and so on until you get to the end of the run. The hot wires, neutral wires, and grounding wires are all connected in a way that provides a safe, continuous loop. However, sometimes you will find yourself faced with a case where you are trying to connect too many device boxes in a certain area and you have to run excessive amounts of cable between them, drilling lots of holes in your studs. 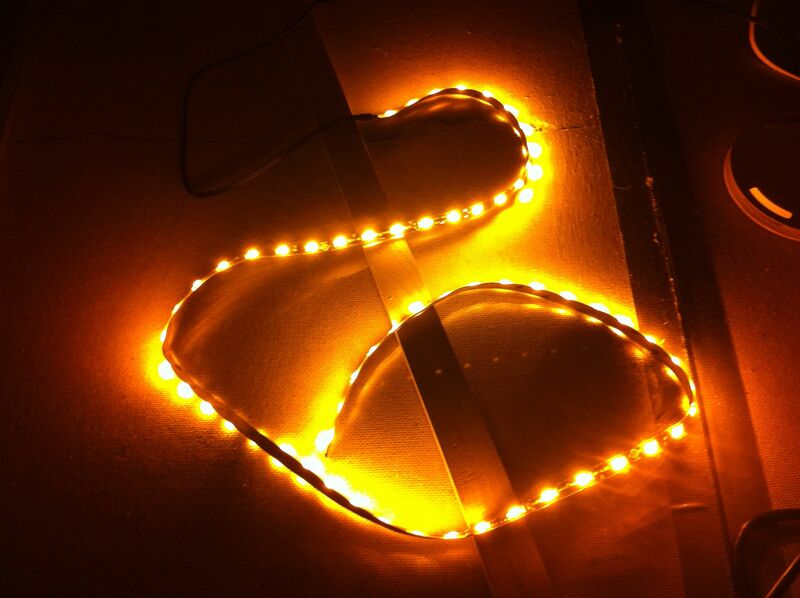 Or you might have pancake light boxes within the circuit that you would prefer to have at the end of circuit so that you are not running multiple cables in and out of the shallow box. 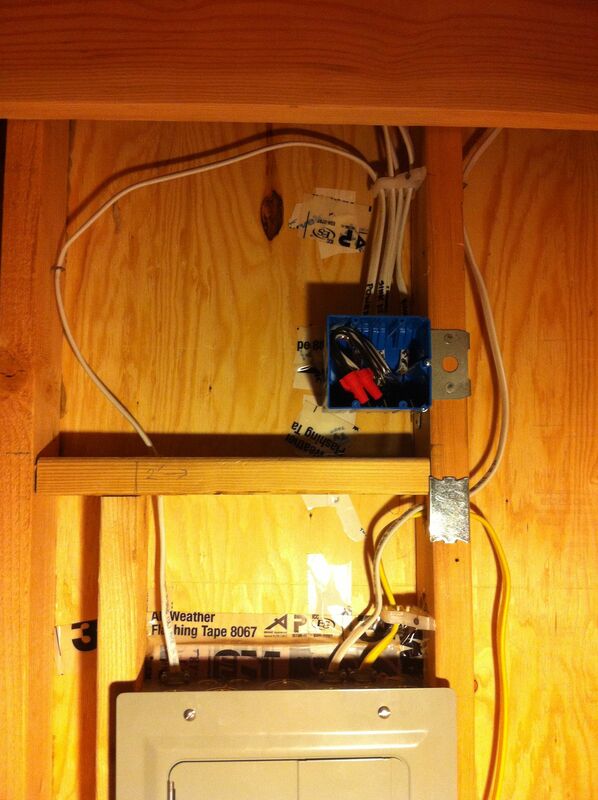 One solution is to put some of the boxes on different circuits, which may or may not help your excess wiring issue. 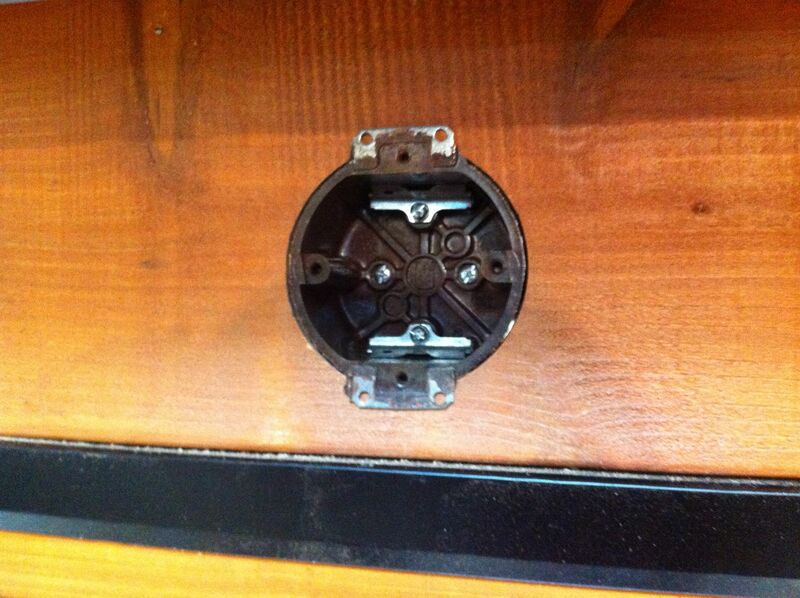 Another option is to to add in a junction box at a key location. 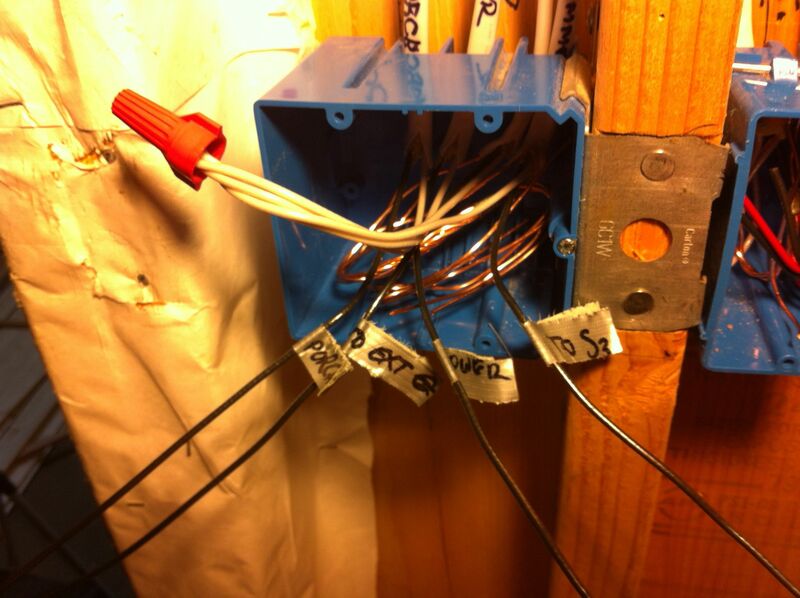 Junction boxes are regular device boxes but instead of housing a device, they serve as a hub for wires that split off into different directions. Inside the box, the conductor wires and the grounds are all connected respectively to maintain the necessary circuit loops. Just like with device boxes, you need to size them appropriately, staying under the maximum box fill capacity. While they don’t contain devices, the number of cables entering into the box and the number and size of wiring nuts you are using can take up substantial space if you try to cram too much into one. 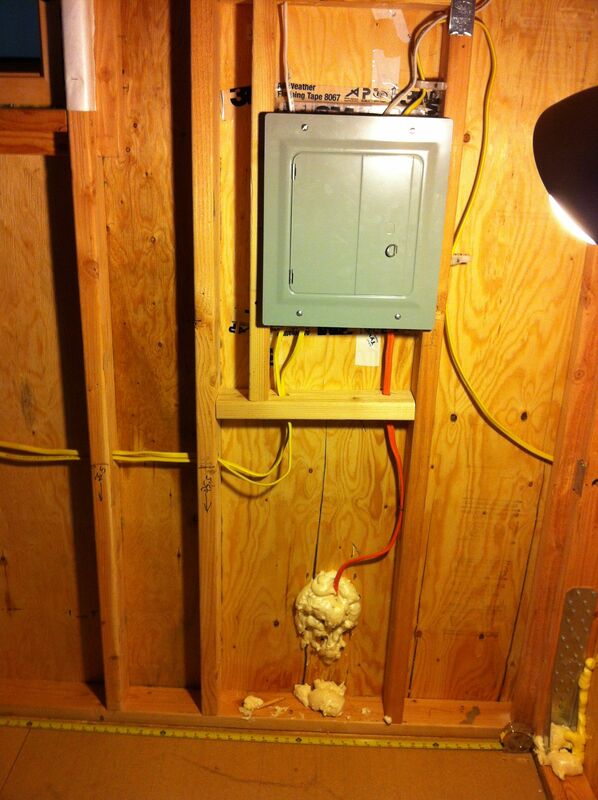 You cover the box with a blank plate, but note that all junction boxes need to be easily accessible so be aware that you will see that blank plate on your wall (though you may be able to locate it so that it is not readily visible but still accessible). 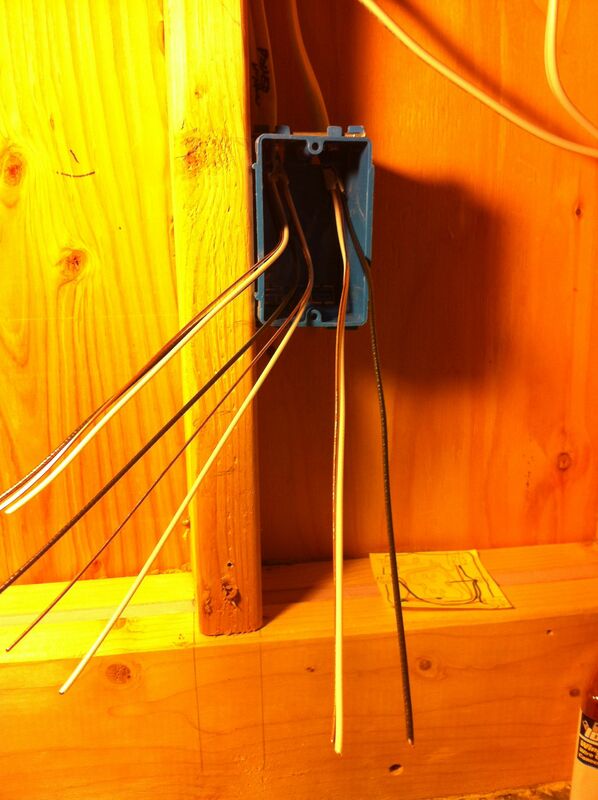 I used a couple junction boxes in my house. In one case, I had a circuit with two outlets in the loft, two kitchen task lights using pancake boxes, and my range hood fan. I wanted each kitchen light to be at the end of a run to reduce the number of wires going in and out of the shallow pancake boxes. 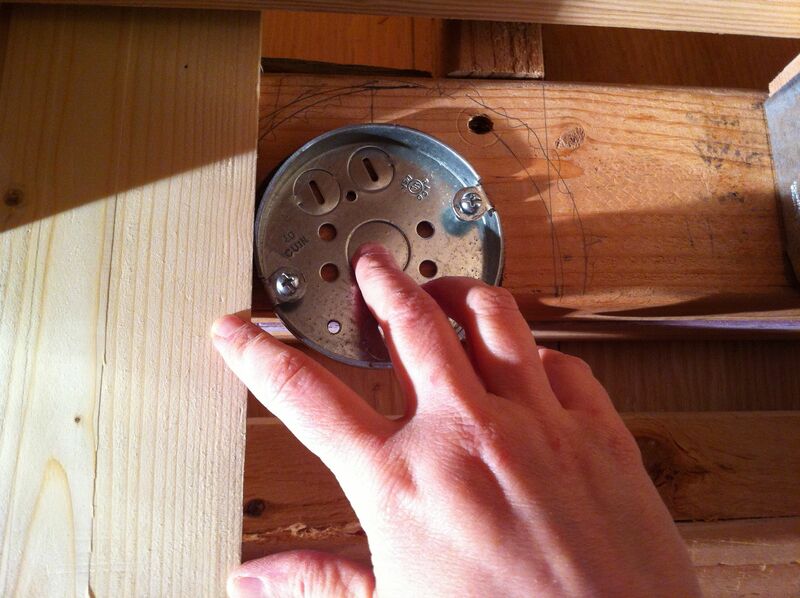 At first I tried to branch the lights off the loft outlets (like mini-hubs), but that meant exceeding the box fill capacity of the outlet boxes and I didn’t want to put in bigger boxes because I’d lose the insulated thermal break between them and the outside sheathing. It seemed silly to break this down into several circuits with parallel wiring and their own breakers since they were so low load. 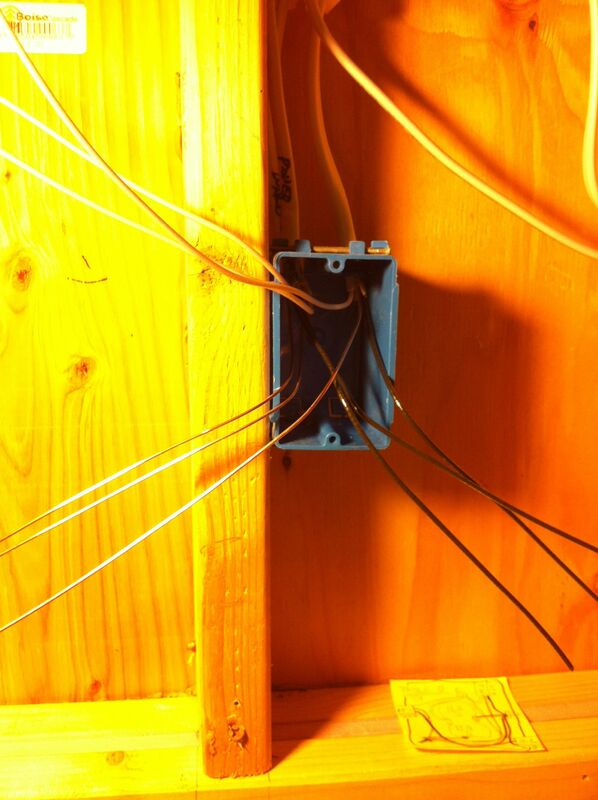 There may be other solutions but a junction box made the most sense to me. 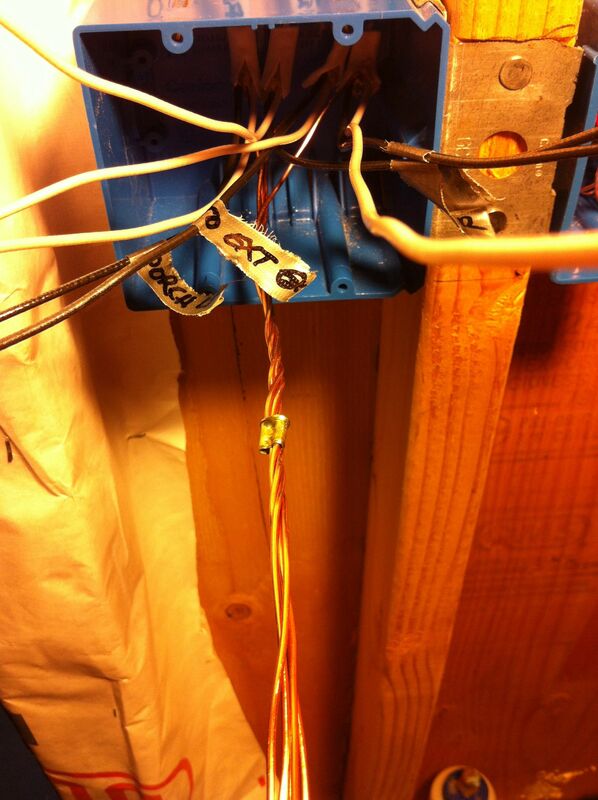 I ran power into the junction box, then split it into three outgoing cables: one to each kitchen light and one that connected the loft outlets and the range hood fan. 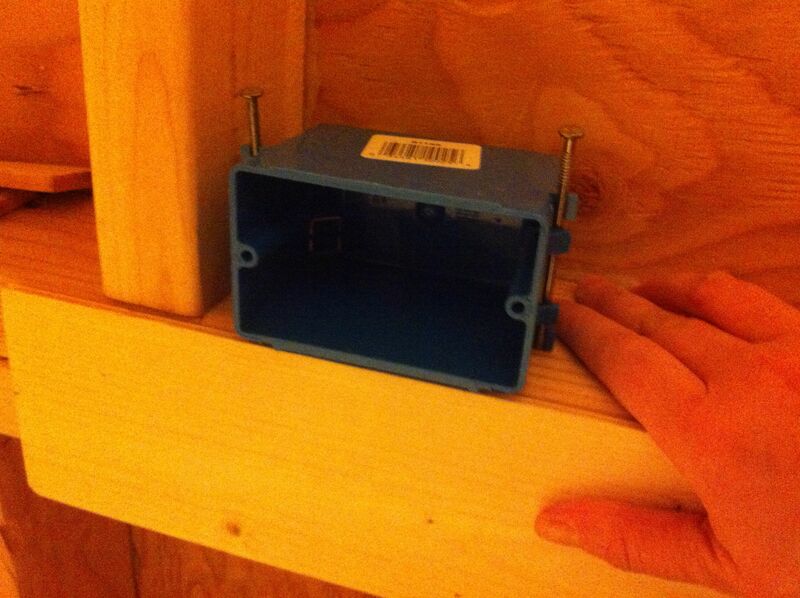 I placed the junction box in the closet so it is accessible but not visible. 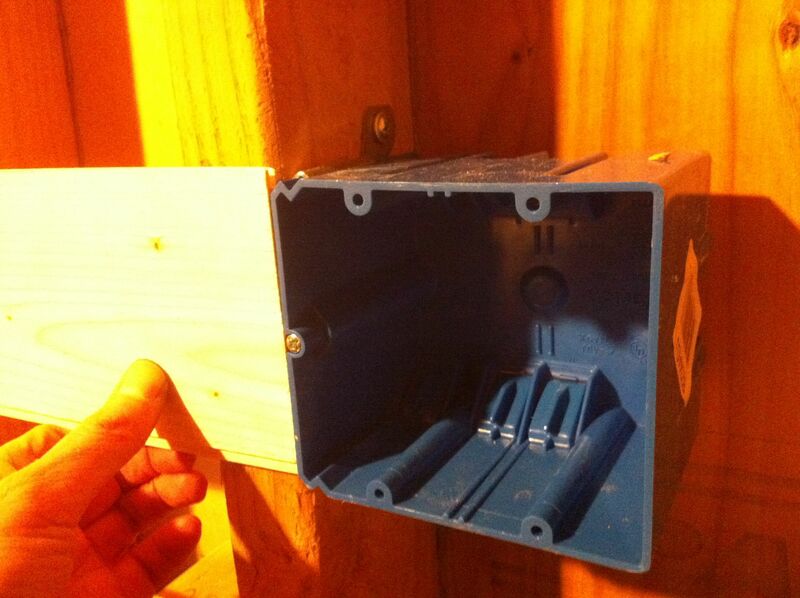 One of my junction boxes. As I mentioned, I installed a couple of outlets on the outside of my house. In these cases, thermal breaks and box fill capacity is less of an issue because there is some distance the box has to go through to get through your siding, your rainscreen wall (gap between your siding and your sheathing which you should have), and the sheathing itself. You will inevitably have room for insulation between the back of the box and your interior wall board even if you use a standard 3.5″ deep device box. Testing the wing mechanism on a spare piece of siding. I centered and marked the location on a row of siding, drilled holes at the corners and used a jig saw to cut out the opening. 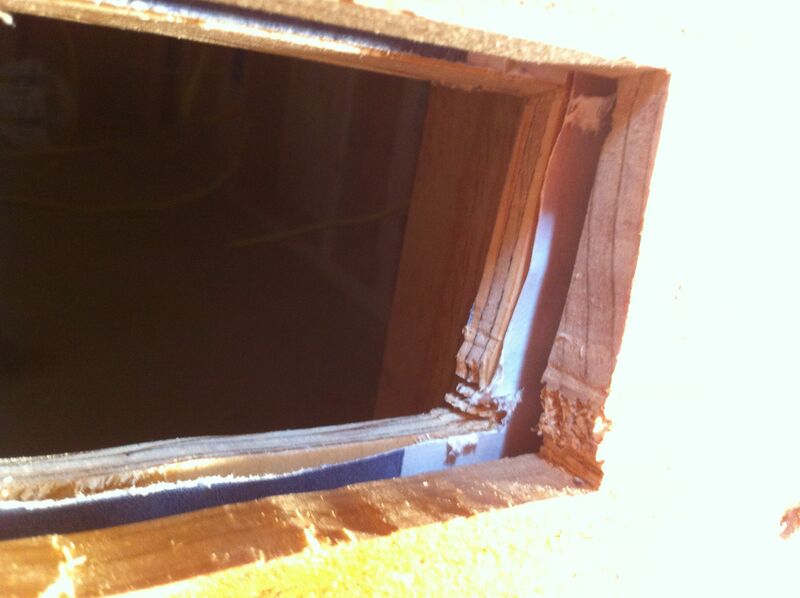 Cutting through the wall of my house for the first time felt like giving a dear friend a tracheotomy. Profile shot showing the siding, the rainscreen wall gap and the sheathing. Installing the box and rotating the wings outward. A fuzzy picture of the backside of the cover, showing the gasket that seals out moisture. The cover closed. Although it’s made of plastic, I liked this model because it allows you to plug something in and run the cord out a hole in the corner while the cover remains closed. The installed box as seen from the interior. 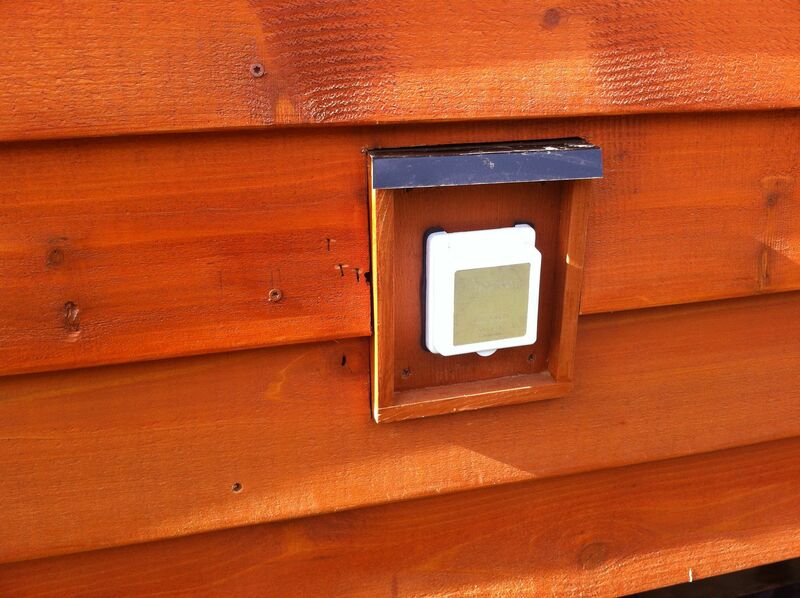 It’s canted since it’s flush-mounted on bevel siding. I then used 3M flashing tape to seal the gaps around the exterior boxes, both to provide an air barrier and also to prevent the spray foam in the next step from extruding to the outside. 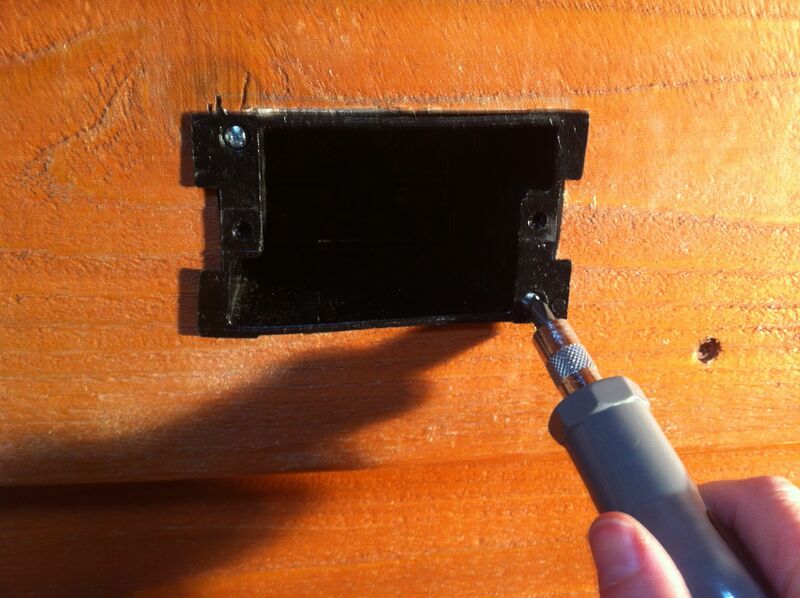 I applied the spray foam to all of the exterior outlets, the porch light, and the power inlet. 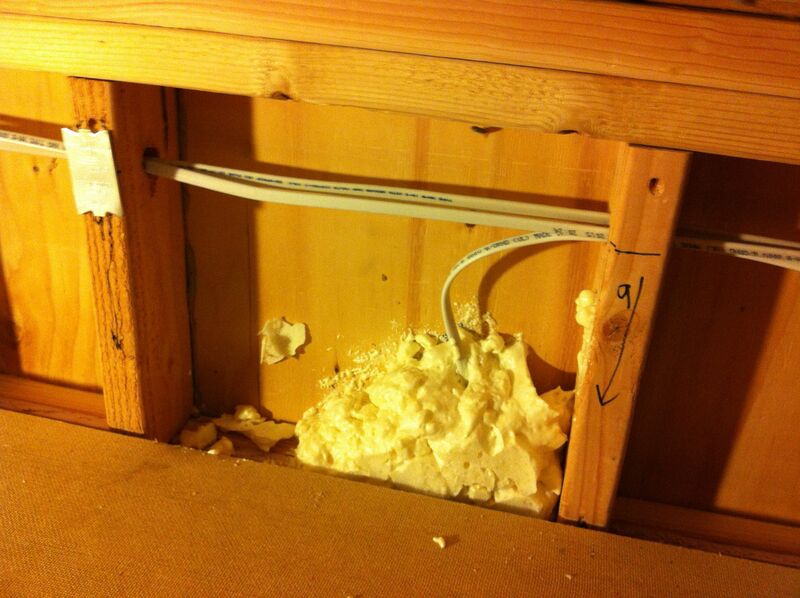 It helped in some cases to put a piece of cardboard under the outlet so the spray foam would stay in place. 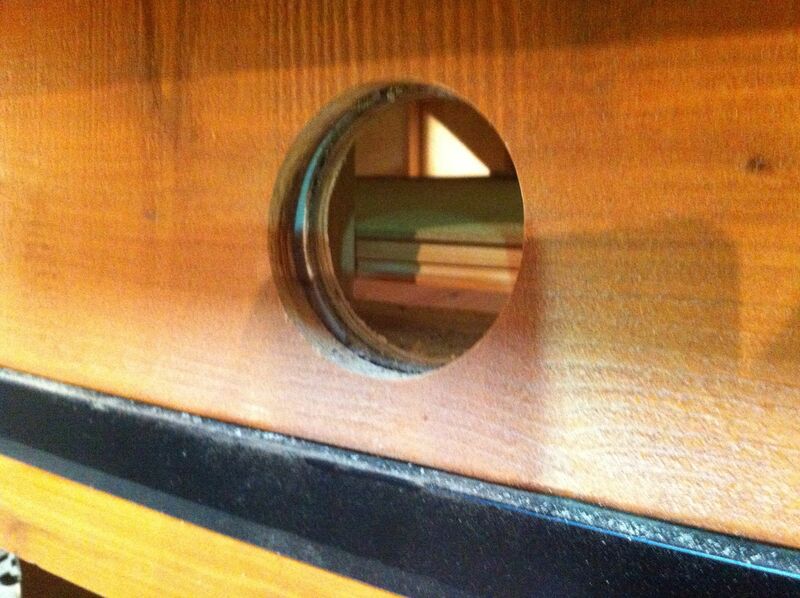 This is what it looked like once I started installing my tongue-in-groove paneling and wool insulation. If you have beveled siding, which presents a slanted surface, you may need to install a backing plate to either make the device you’re installing vertical, or because you need to cut through multiple rows of siding and will have an uneven surface to mount to where the siding overlaps. While my porch light and exterior outlets had a tight fit on a single row of siding, I decided I wanted a backing plate for my power inlet. 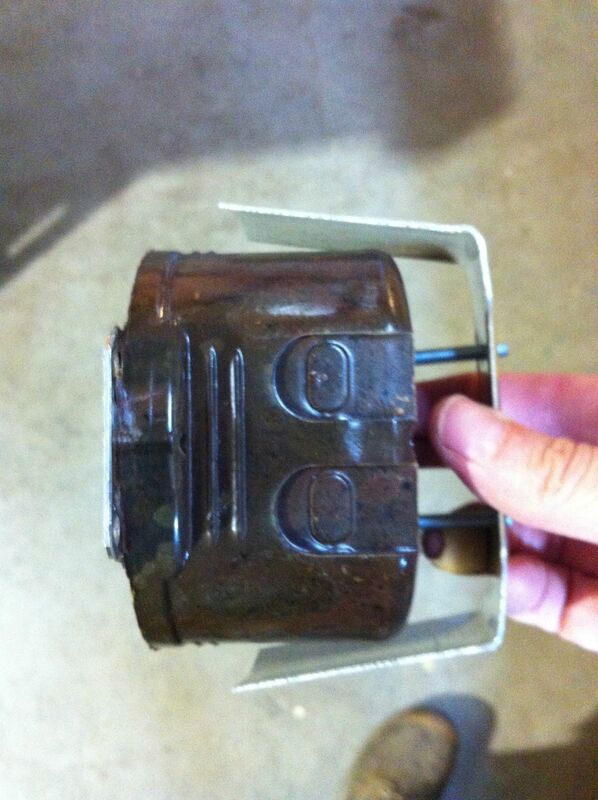 I will also need to make these for my range hood vent and my gas fireplace vent. The main lesson learned here is you absolutely need a multi-tool with an oscillating blade to cut through the siding cleanly while leaving the sheathing intact (the sheathing only has a small hole drilled through it to run the cable). I knew this but since I didn’t have one, I tried a jigsaw. Despite my best effort, it bucked out when it hit the sheathing and gashed up my siding before I could react. Another thing to consider is installing some flashing at the so that any moisture running down your rainwall won’t rot the top of your backing plate. 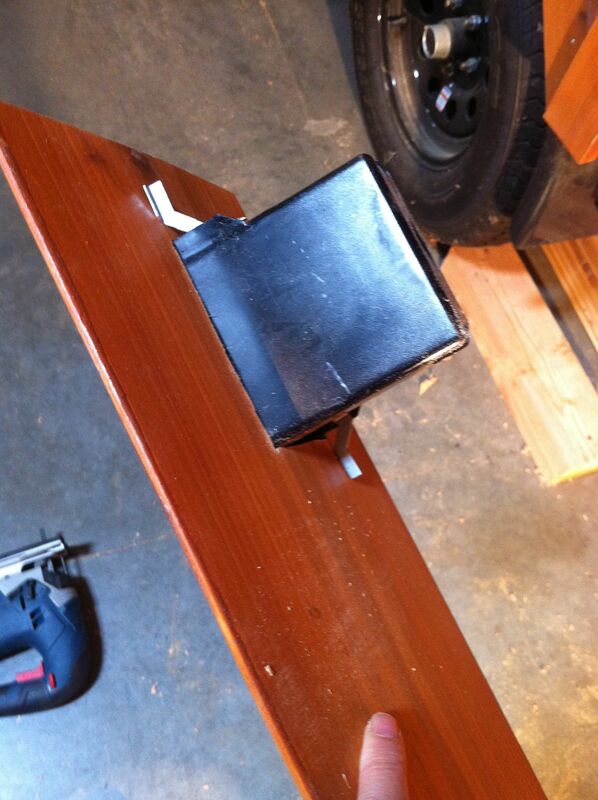 Adding some sides to the backing plate to extend out slightly so the cut edges if siding won’t be exposed to weather. The installed inlet with my awful jigsaw gashes! Switches are different than outlets in that the neutral wires don’t connect to the switch device itself but are wired to each other. If you want your switch (or outlet for that matter) to be further out from a stud, you can throw up one or two pieces of 2×4 to create the separation and act as a nailing surface. Here us a case where I wanted a switch near a window but wanted to leave room for the window trim plus some wall space. 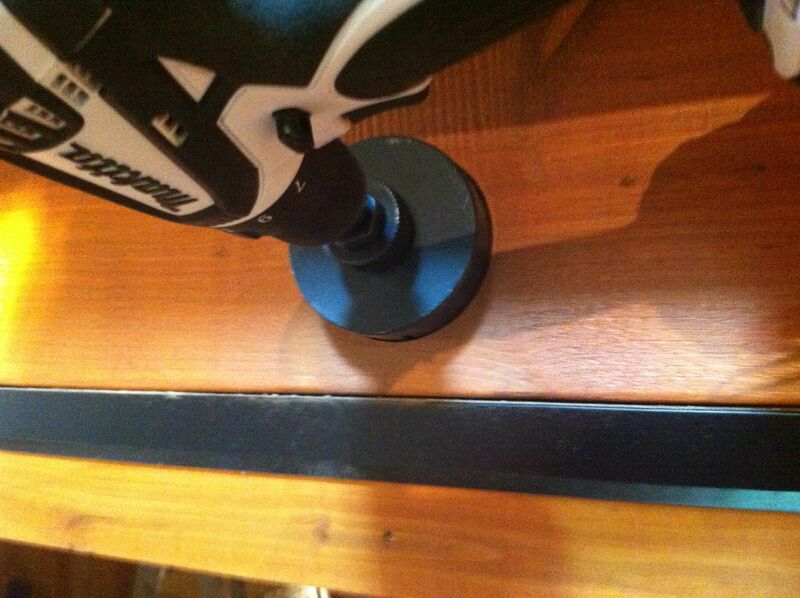 These spacers are also handy when mounting a box near a corner of a room (see next photo, box on the left). 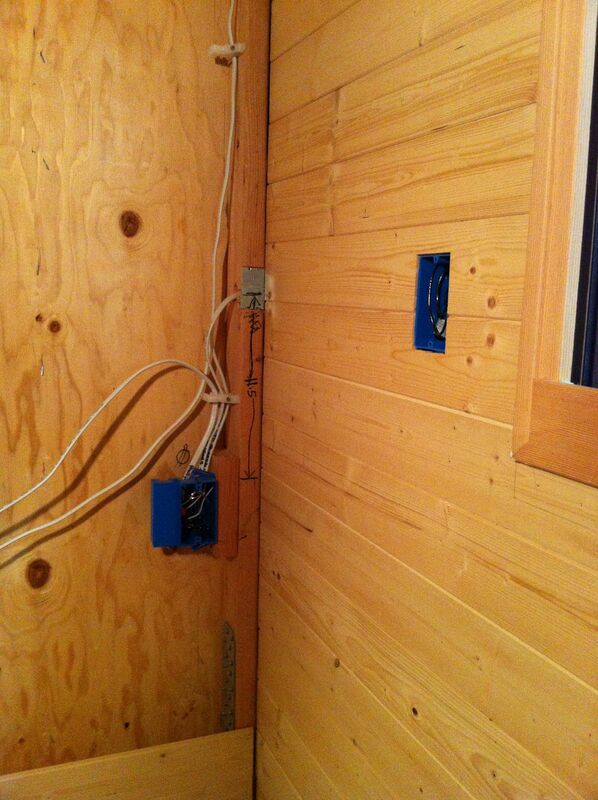 Here is what the switch box by the window looks like once the paneling is up (box on the right). As with device boxes for switches and outlets, there are a variety of options for lights and fans. Below are some photo galleries describing how I installed some of the types you might encounter. A few types of fixture boxes: metal pancake box, nail-in box, hanging box on adjustable sliders, and a fan or saddle box. A neighborhood walk find…just wanted to see if you are still paying attention! These are typically used in ceilings but I used them on either side of a window to install my sconces since there weren’t studs where I needed them. The nice thing is you can easily position the box left to right along the sliding arms before locking it in place. 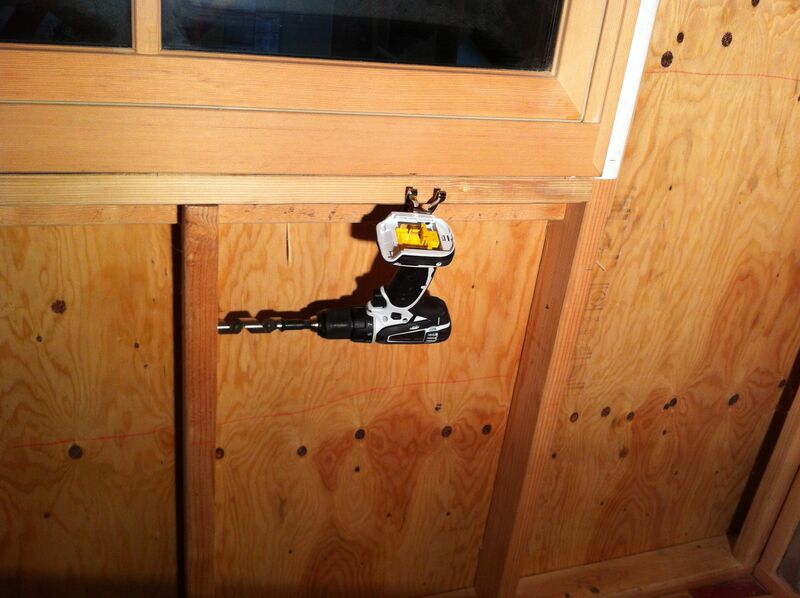 The hard part is getting it positioned out into the room the right distance to be flush with your wallboard. I added some nailers to attach the arms to and adjusted it right to left. 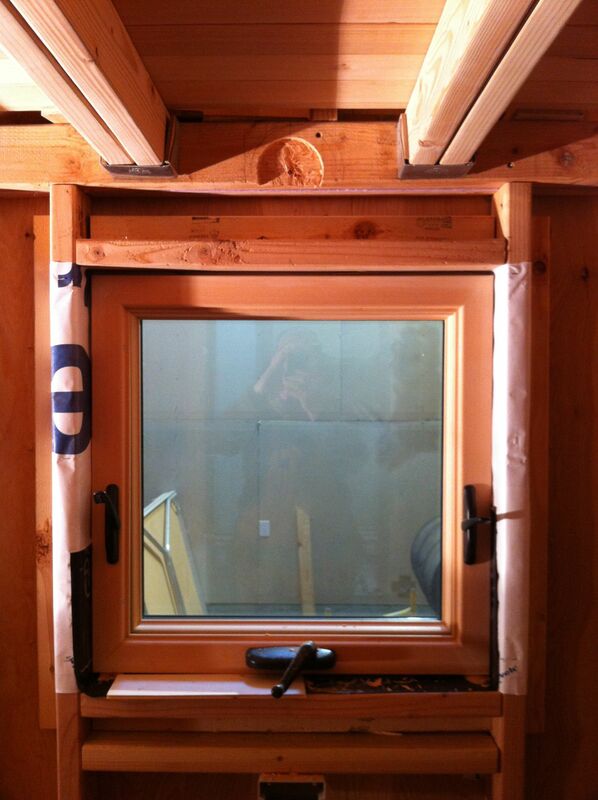 Don’t forget to factor in any window trim if you are trying to center them. I put up a scrap piece of wall board to help figure out the front to back placement. There were a couple places where I wanted a light right on top of a stud. Later Todd mentioned there were cheaper options, but I used a fan saddle box. These are screwed deeply into the stud and are very heavy duty since they are designed to support the weight, rotation, and vibration of a ceiling fan. Both my lights are swing arms so it was good to know they will be well-supported. 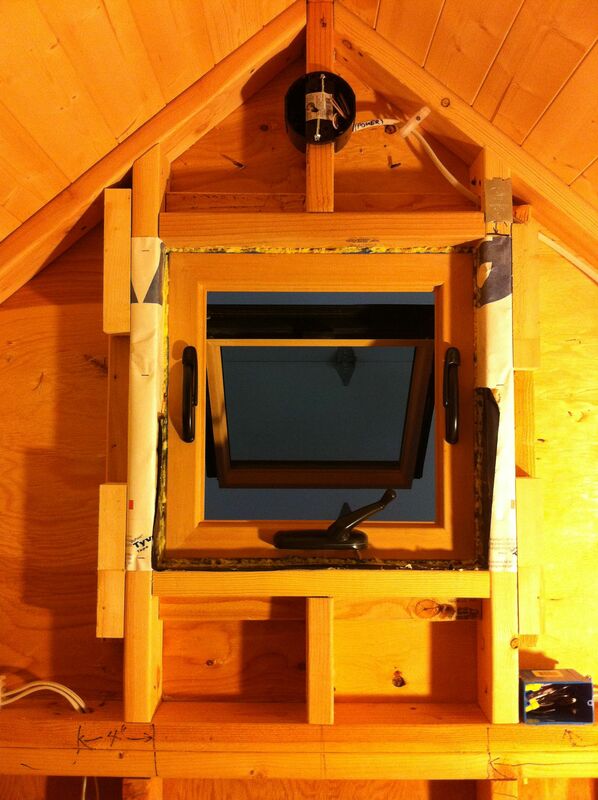 A saddle box installed in the loft peak. One thing I encountered was that the lip of the saddle box sticks out beyond the wall paneling. 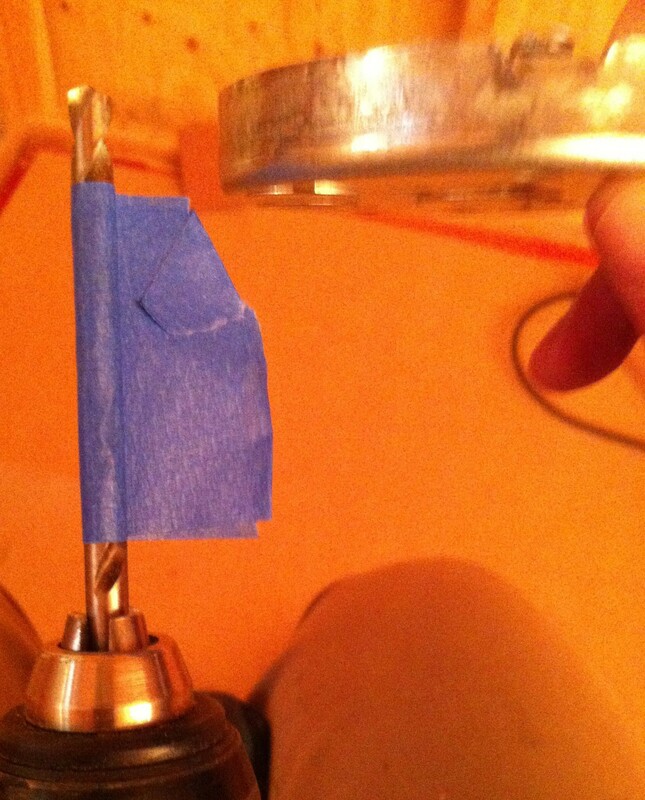 This was a case where I was glad I had my light fixture in hand to confirm the base would work. 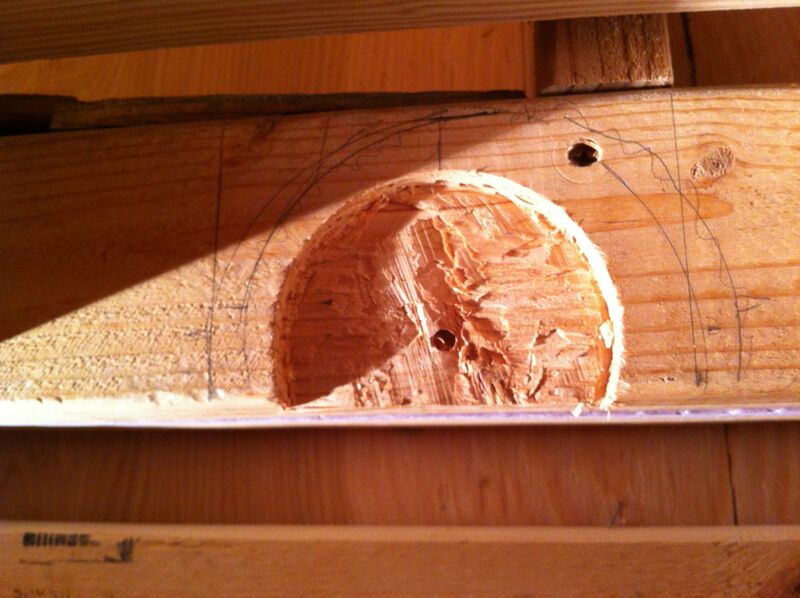 I figured out where I wanted to center the box and drilled a pilot hole for the hole saw. Since the bulk of the box is on the header and it will be surrounded by paneling, it’s okay that it hangs off a bit. I marked how deep I wanted to go on the hole saw (1/2″ for the box minus the width of the wall board so it would be flush). 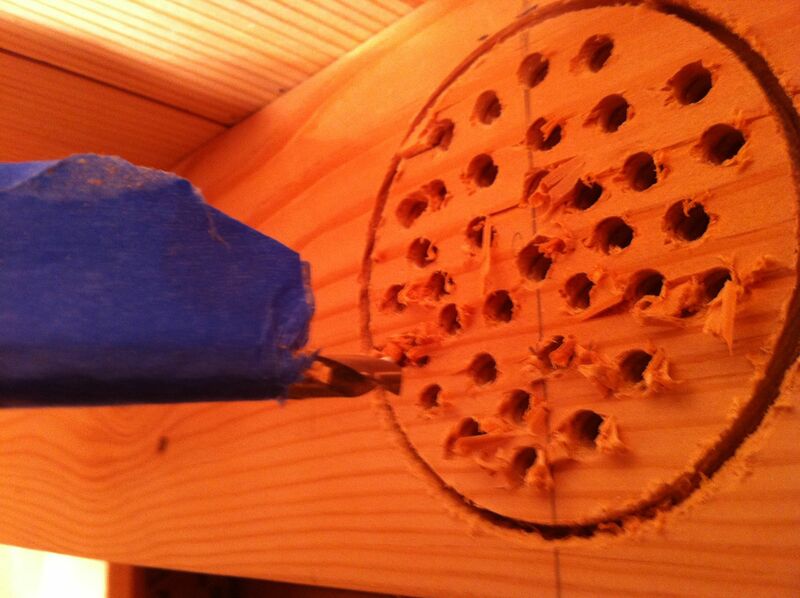 I fit the center arbor into the pilot hole and started drilling. It helps to go in reverse briefly to establish a groove otherwise it can quickly bite in and whip your hand around. 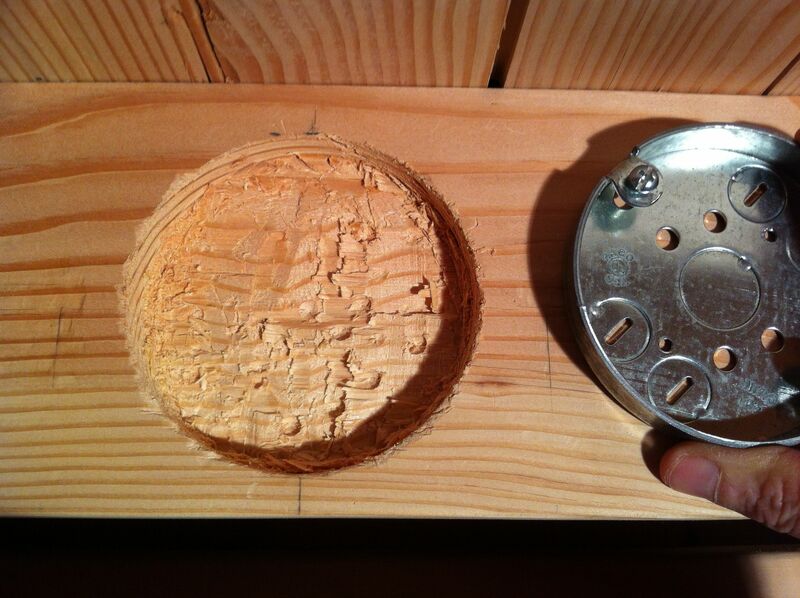 …then you have to chisel it out. Since you are coming in at an angle, it’s tricky getting a flat bottom and a consistent depth. 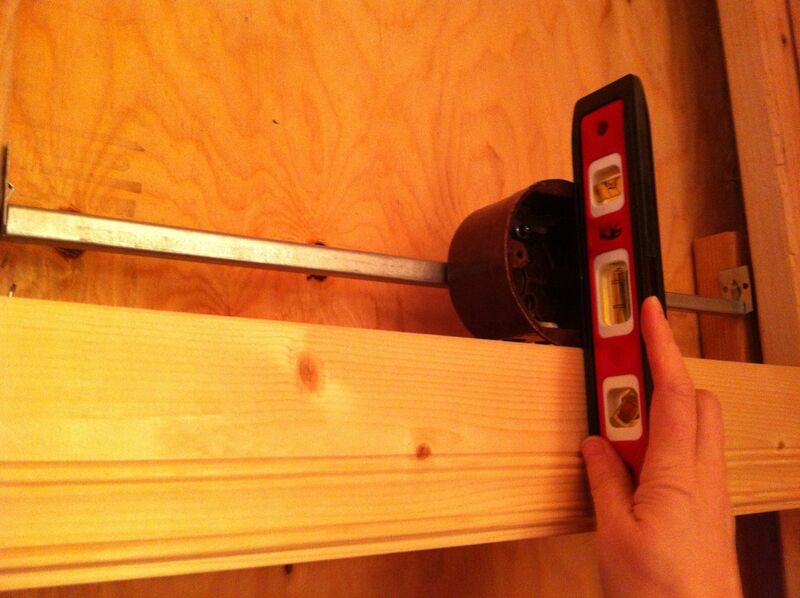 Checking the depth against a piece of paneling. Ready to drill the hole for the cable and mount the box. 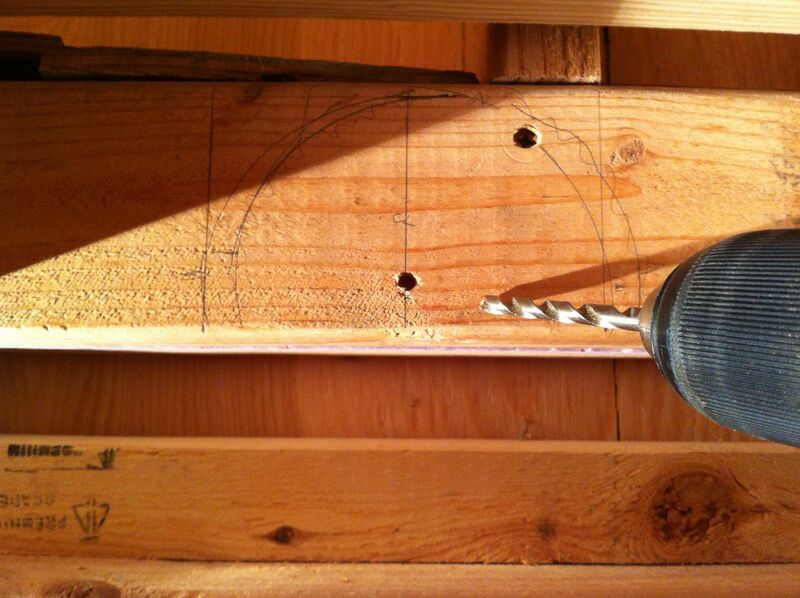 I took a large drill bit and marked my depth. 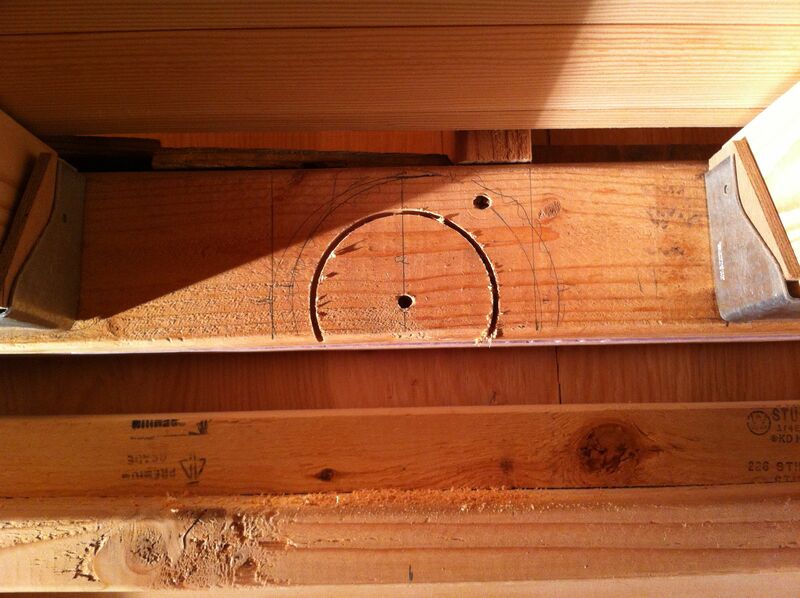 Since this was on the joist and wouldn’t have paneling, I went the full depth of the box. 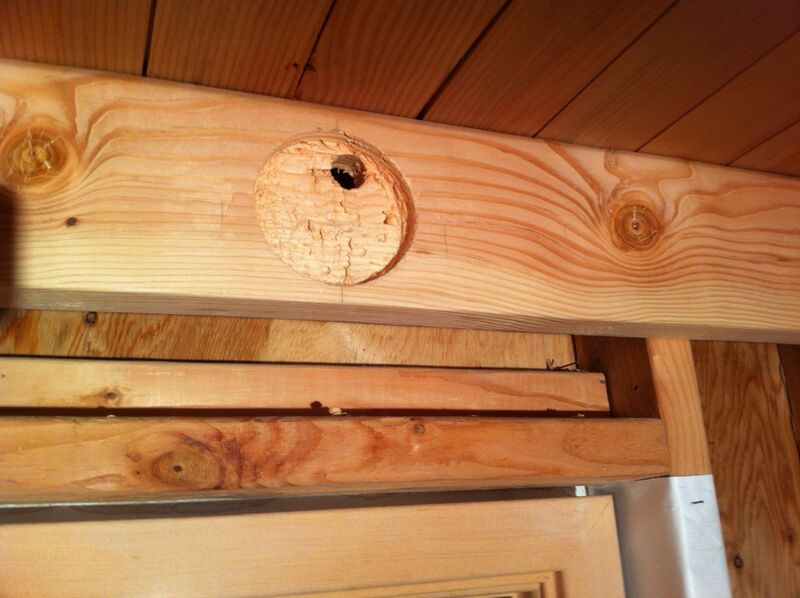 I then randomly drilled a bunch of hole to the same depth. …and here it is finished. Ta da! A much more secure fit. After the hole for the cable was drilled. Putting in the box for the porch light was similar to putting in the exterior outlets but I had to figure out what to do about the flange since it wasn’t the right size for my siding depth. All it took was a sawing the flange down with a metal saw. Like with the exterior outlets, this was an old work box. Marked my center, drilled a pilot hole, did a reverse few turns of the hole saws to establish a groove then went forward all the way through the sheathing. The hole into the interior. The length of the flanges initially. 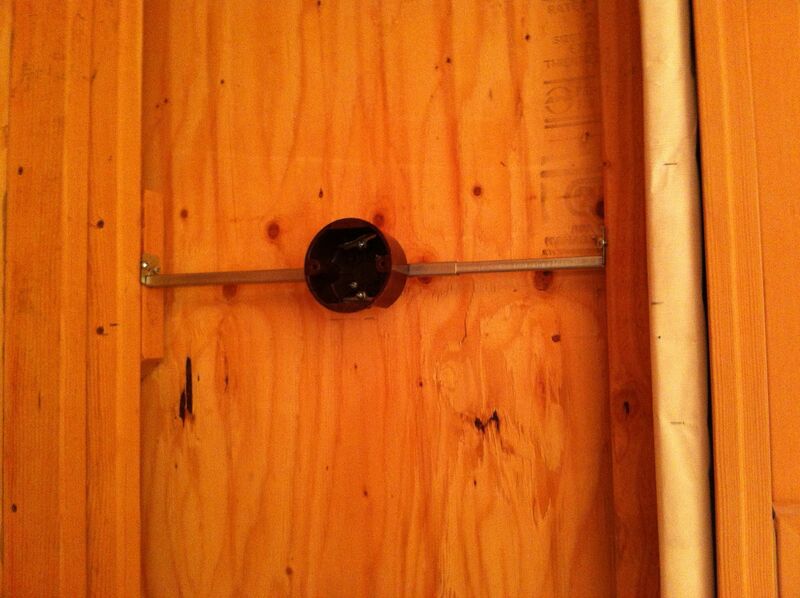 The screws weren’t long enough to push the flange far enough back to fit behind the siding and sheathing. But they can be cut to fit. I bent the flanges out a bit to make sure they’d grip. The box installed and tightened down. After I ran the cable in I taped up the gap around it and spray foamed it for a good seal. The front of my house with the boxes for the porch light and two exterior outlets installed. The upper one is controlled by a switch inside to turn string lights off and on. 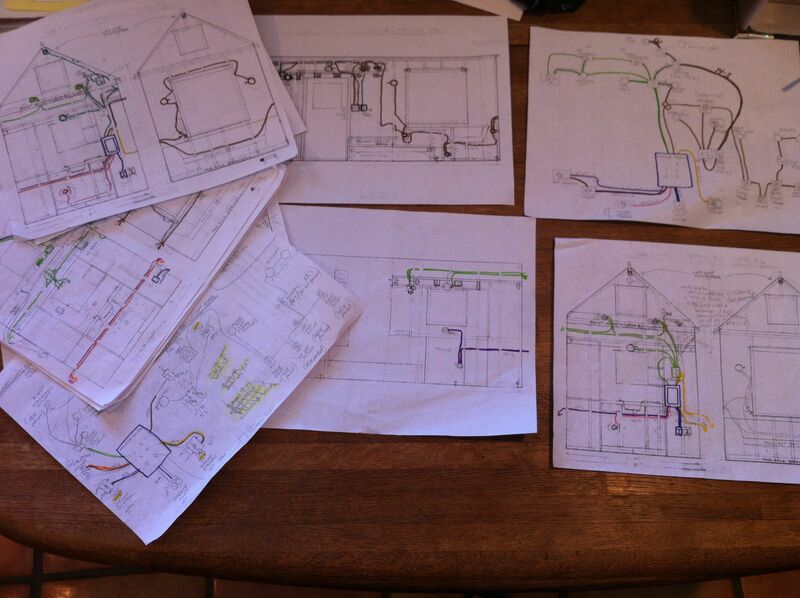 Here are a series of photo galleries illustrating each step as I did the rough-in wiring for Naj Haus. As with the galleries above, click on them to bring up the slideshow. The captions are full of specific tips. 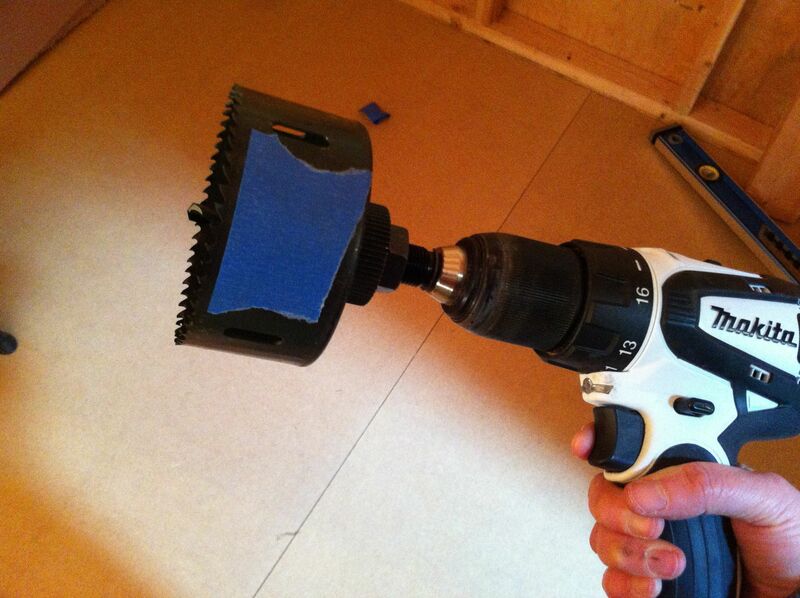 I used a 7/8″ auger bit, though you can also use a 3/4″. 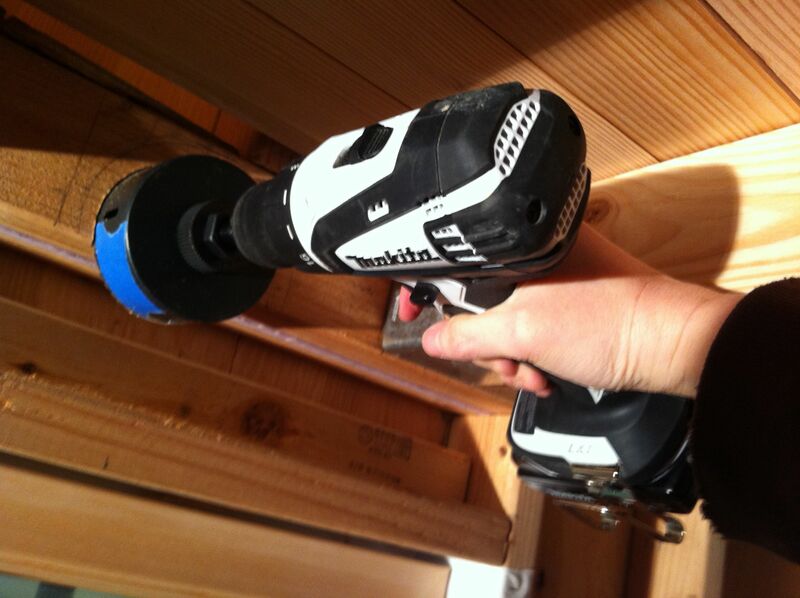 You can get longer ones to drill through multiple studs at a time and right angle drills. 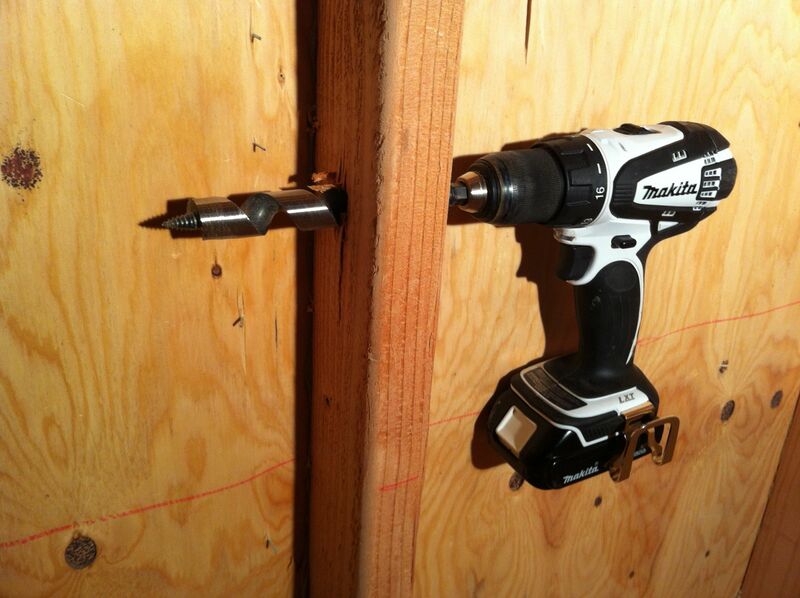 There were a few times I wished I had the right angle drill but this set-up worked fine. Be sure to locate cable away from areas you where you are putting plumbing or gas lines in, places where you will be securing cabinets and built in furniture to the walls, etc. There is so much torque involved that you have to be very careful not to get a body part in the way when it suddenly whips around. You learn to anticipate which way it will go and brace yourself. Not sure why there isn’t a battery in this pic – it must have died. You drain them quickly with this work. 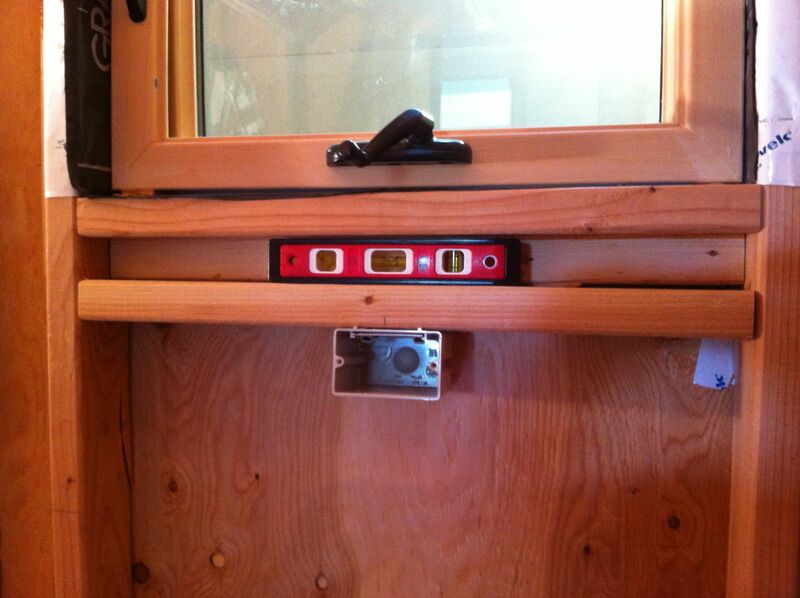 It doesn’t really matter in a tiny house whether you start at the breaker box or end there. 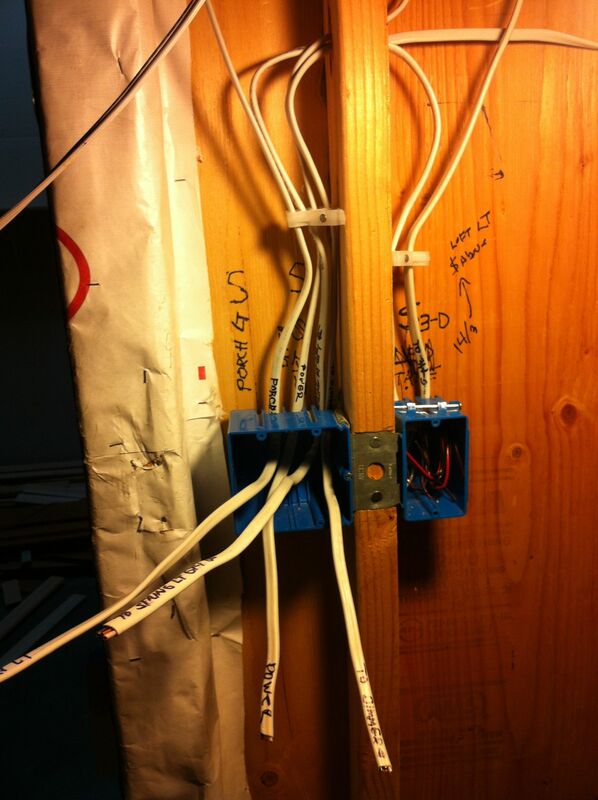 I had read somewhere to leave 4′ of extra cable for each circuit to wire the breaker box. I think that is probably excessive in a tiny house but do leave plenty extra. Before starting a circuit, make sure you know what gauge wire that circuit needs. Since the knock-out holes going into the breaker box have sharp edges, you’ll need to get inserts that snap or screw in to protect the cable from being cut. 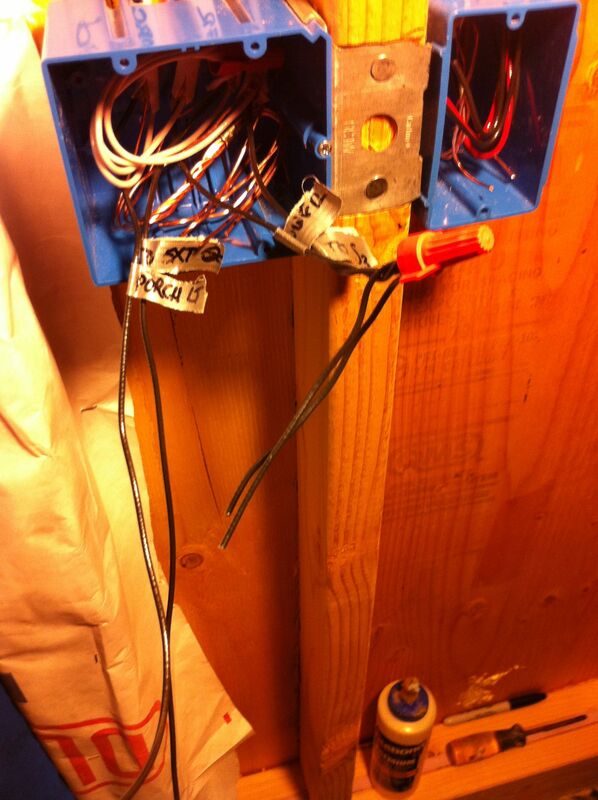 As I mentioned, I had an electrician wire the breaker box and add the power inlet after I had wired the circuits. Pull cable off the roll and run it through your fingers to straighten it a bit – this makes it easier to thread through the holes and avoids kinking the wire. 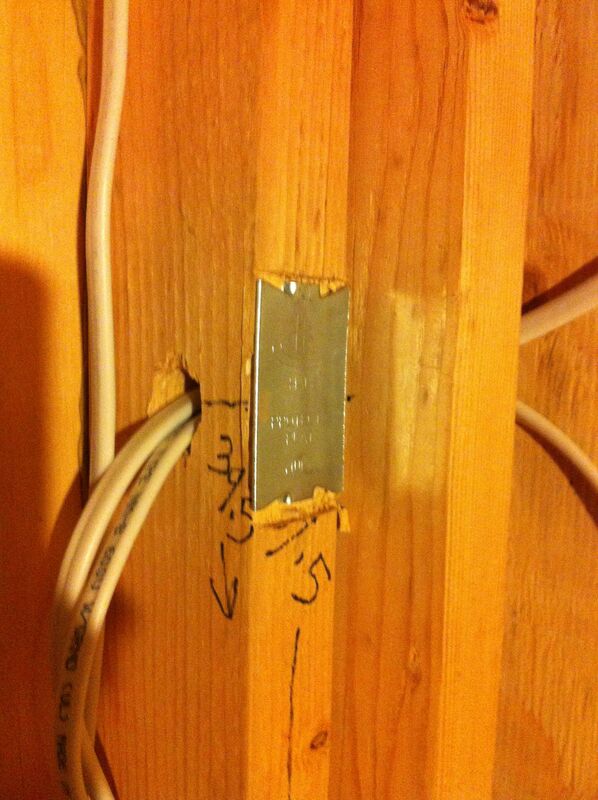 The circuit is wired in segments, from box to box, so the lengths of cable are fairly short in most cases in a tiny house. Thread the cable through one of the holes in the box and cut it about 8″ beyond the box to use when you wire your devices. It’s best to run all cables in and out of either the top or the bottom of the box; this helps the wires to fold neatly back into the box when you are making them up. Don’t pull the cable tight – leave some slack and make “jug handle” curves as you change direction. 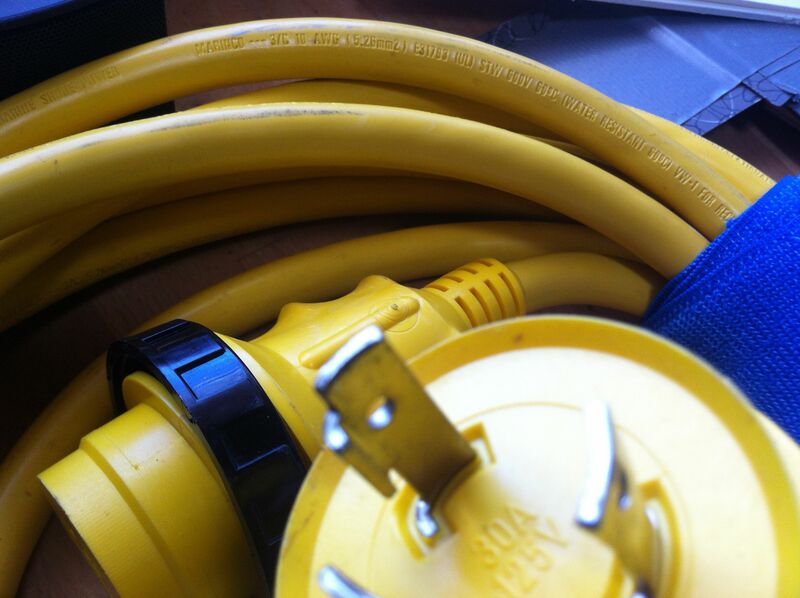 Check your code to know at what points you need to anchor your cable. 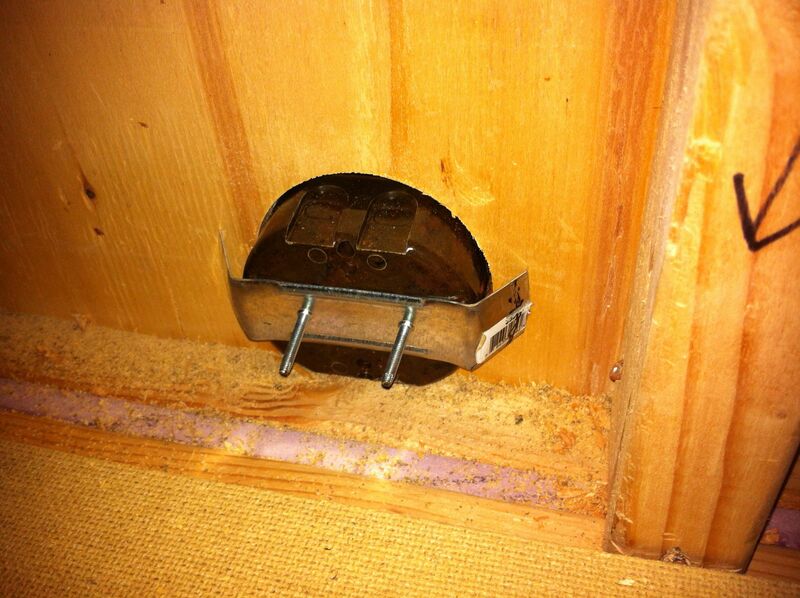 Within a box, there can be a clamp that is screwed in like here (it’s not yet secured properly). 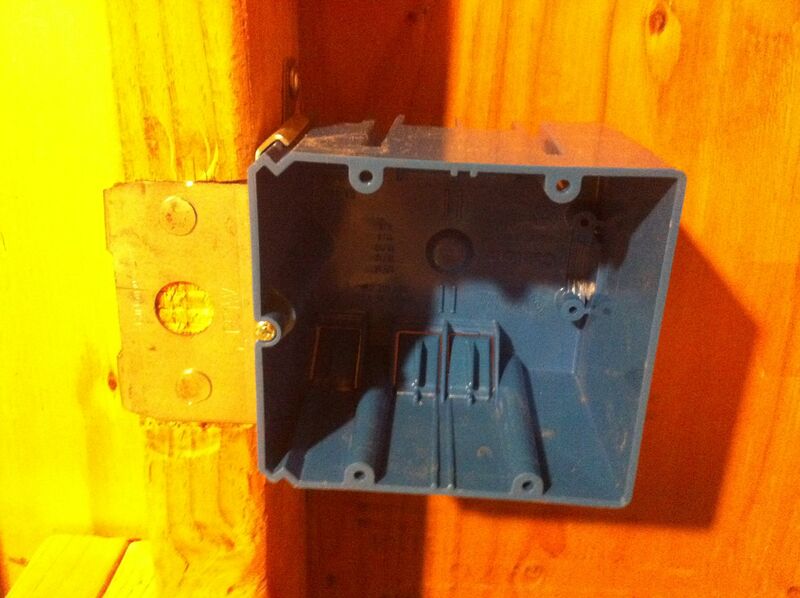 Plastic boxes usually have little plastic flaps that help to hold cable at the knock out hole. 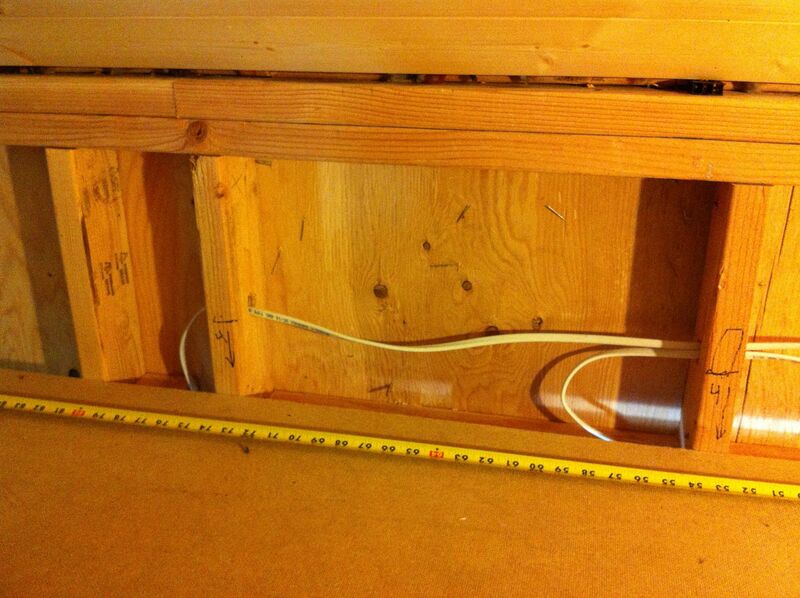 You will also need to secure the cable near where it enters the box and periodically along the run to the next box. Given the vibrations that tiny houses on wheels are subjected to, err on the side of plenty of anchoring so wires won’t pull or work loose. You can use staples, being careful to not damage the cable when you pound them in. Often you will have more than one cable running in parallel. 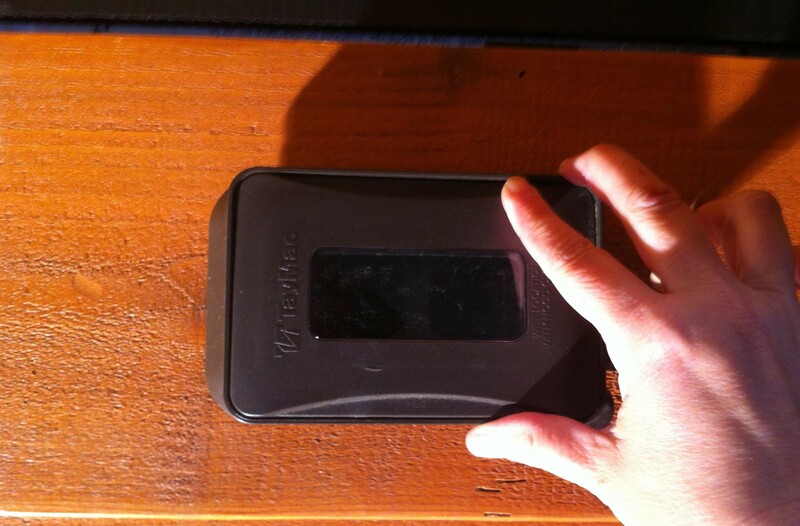 You can use one staple to secure up to two cables in one place, but more than that require a gadget called a Stack-It. Here is a close-up of a Stack-It. It has an angled nail to secure it to the wall and is about 3.5″ long at its base so the wires are automatically positioned in the center of the stud. You just slide the cable in one of the slots. Its not a tight hold but sufficient to keep it in place. I became quite fond of Stack-Its after my bloodiest accident to-date pounding my finger trying to hold a staple. Since I had a whole bag of them, I used them just about everywhere, even if I only had to secure one cable. 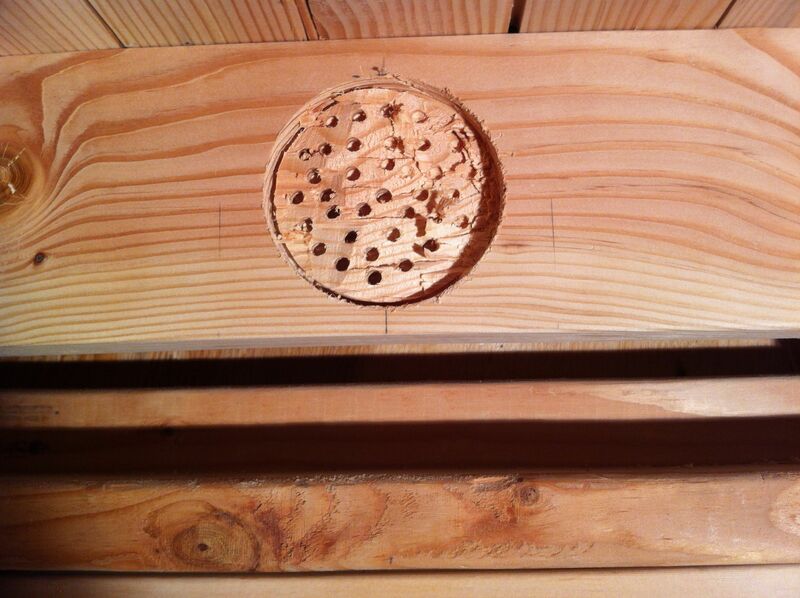 Ideally, you need to drill your holes so that they are in the exact center of the studs, at least 1.25″ in from the interior wall surface. This is to reduce the possibility that you will pierce the cable with a nail if you are doing something like hanging a picture. Occasionally you either misjudge or you need to drill at an angle to get around a corner and you end up with less than the minimum distance. 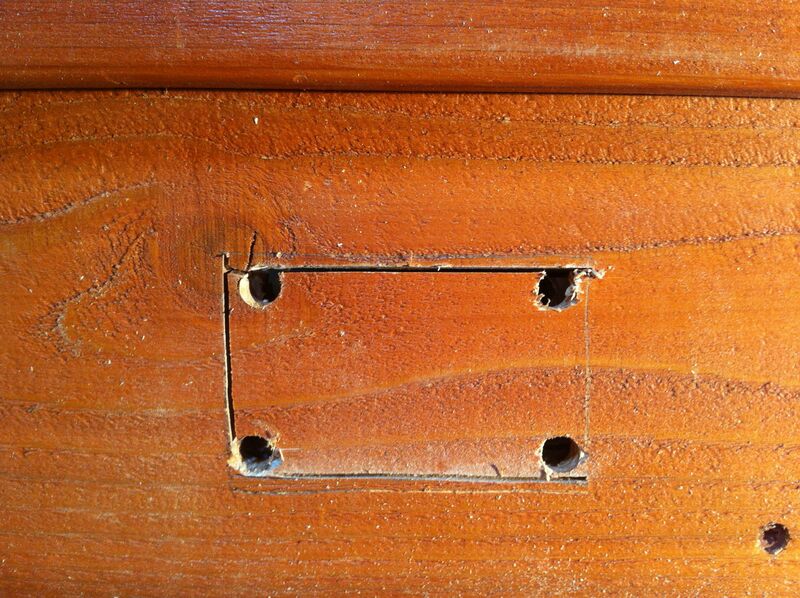 I found it was easiest to check each hole at the time of drilling (before I ran the cable) and mark the stud to add a nail plate later. That way I didn’t have to go through and measure later. An installed plate. They have sharp points on them and just pound in with a hammer. At first I was chiseling out beneath it so that it would be flush with the stud since I was worried my paneling wouldn’t lie flat, but it turns out that at least with 1/4″ tongue-in-groove, it handles well over the plates. Are you awake?! 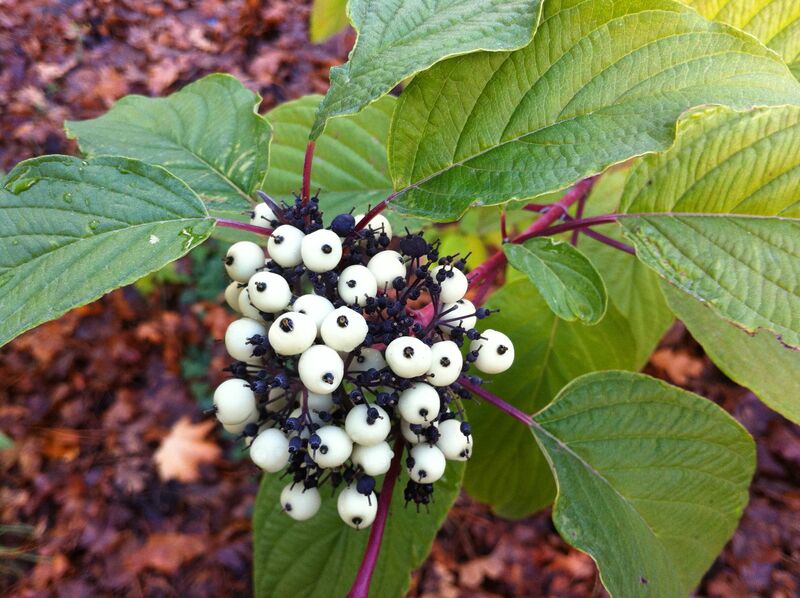 Not to worry, the end is in sight… (here are some eyeball berries found in our yard for you amusement). 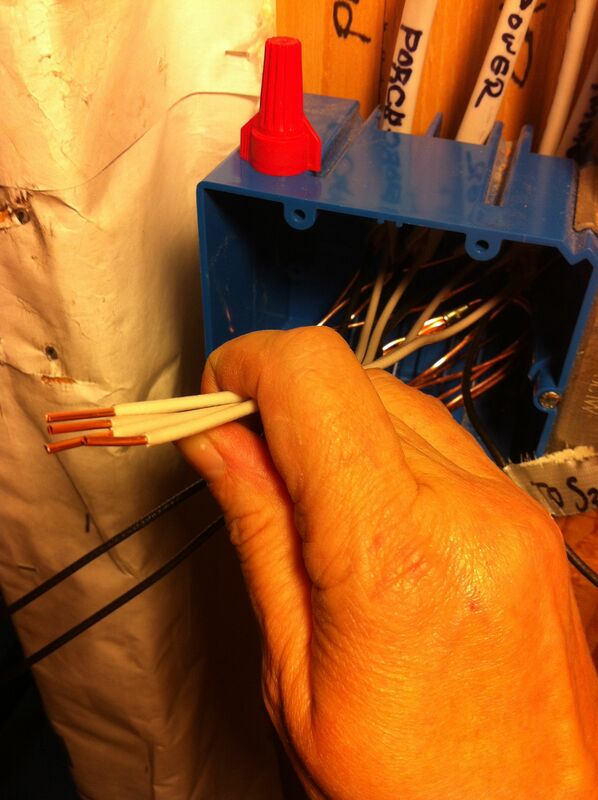 Once you have run and anchored your cable, you need to “make up” your boxes. 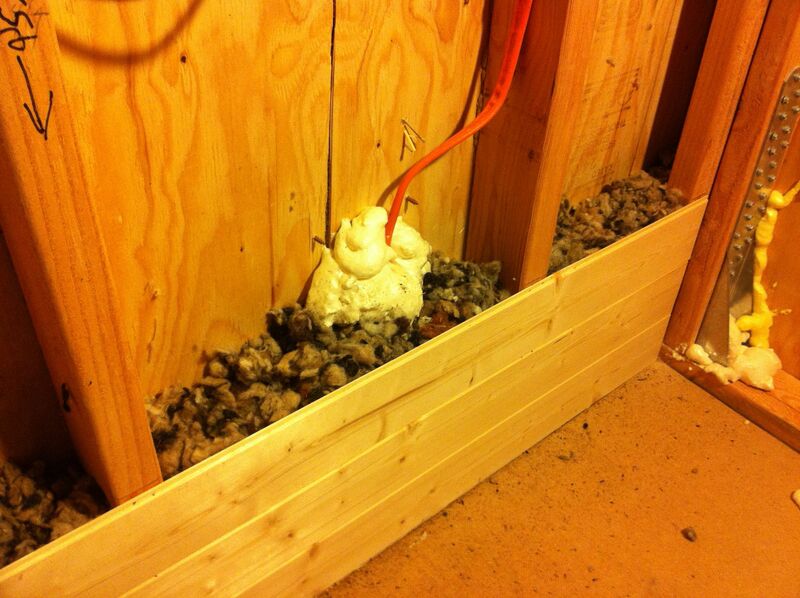 This entails stripping the cable, separating the wires, capping and/or crimping the conductors and ground wires, and tucking them all neatly back into the box so that they are out of the way when the insulation and wall board (whatever you are using to cover your walls) goes up. 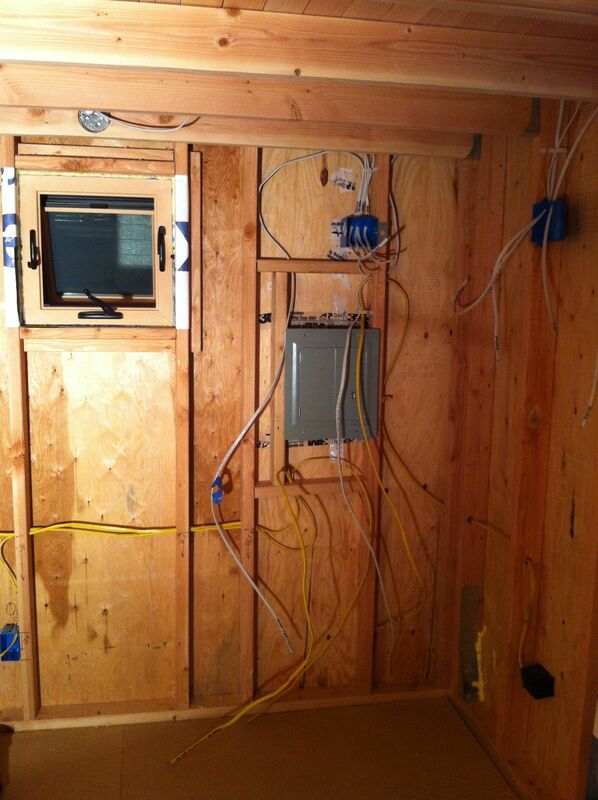 Later you will come back and wire the devices and fixtures themselves and add cover plates. I was extremely nervous about stripping the wires and making up the boxes since I didn’t want to screw up. I was also anxious to get my walls up and didn’t feel like stopping and learning yet more skills to properly make up the boxes at that time. Since it was just me putting the walls up, I wasn’t worried about working around the cables sticking out. However, Todd kept asking me if I had made up my boxes and I finally realized that it would be better to do it now so that if I did screw up, I could run a new section of cable easily before the walls were in. So I buckled down and learned what to do, and did it. 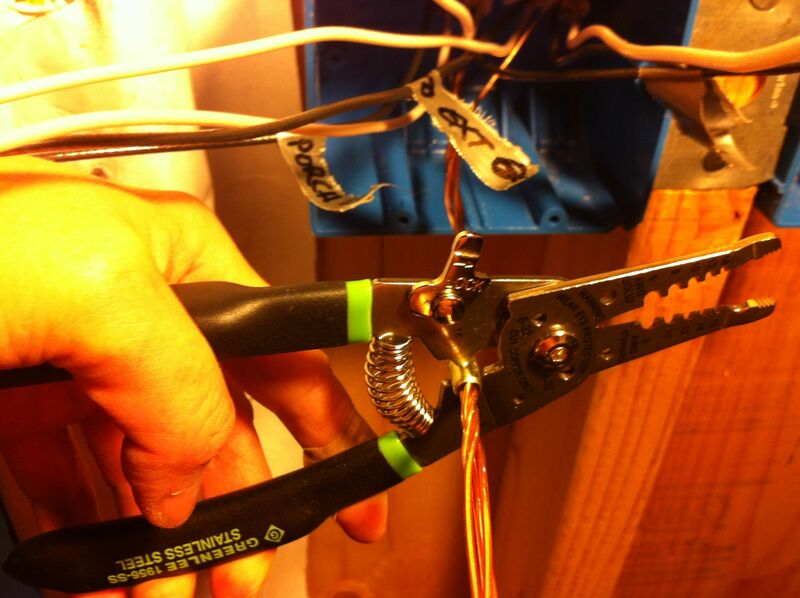 How to properly strip cable from its sheathing so you don’t nick it. 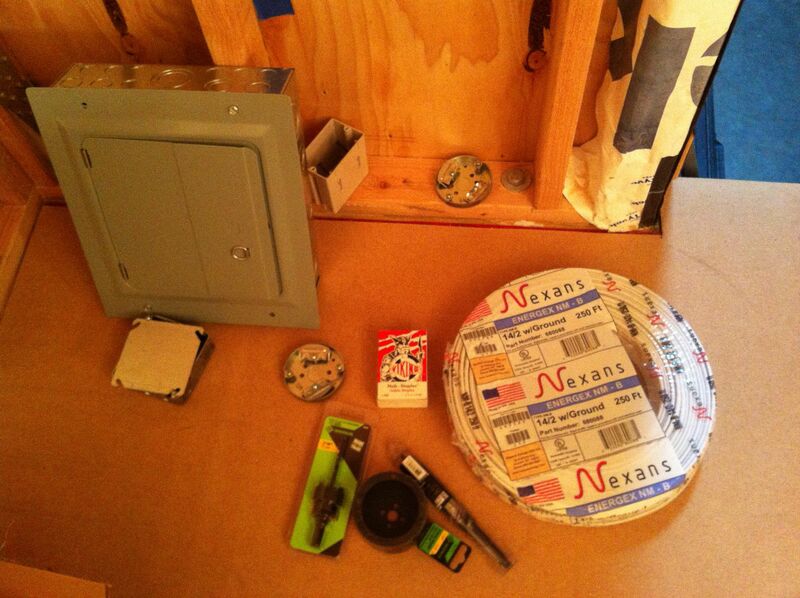 It is good to understand exactly how each device or fixture will be wired before making up the box. Understand wire connectors (wire caps/nuts): the different types, how to choose the right size for a safe connection, and how to properly use them so there is no risk of sparking. Understand about using barrel crimps to secure ground wires together (in places where you would otherwise use a screw on wire connector). I gather this is not consistently required by local codes but given the vibrations of a tiny house on wheels, it is definitely highly recommended. Figure out how you will know which wires attach to what once they are stripped. For a simple end-of-run device, the color of the wires is sufficient, but you don’t want to lose track in more complicated scenarios. See the photo gallery below. Above all, if there is any chance that you will be connecting to your power source before you are completely done installing all your devices and fixtures (perhaps you need a few working lights and outlets to continue building inside), absolutely make sure that you have capped every wire and the grounds are in place so you don’t get shocked accidentally. Always follow proper procedures for disconnecting power sources before working on any box. Here are a couple examples of making up my boxes (click to see tips). I left the wires a little on the long side but will trim them back when I’m wiring in the devices. Here is a box prior to making it up. It is a middle-of-run outlet (receptacle) with one cable coming in bringing power and two cables going out, acting as a mini-hub, branching power to a wall light above and the next receptacle on the circuit. 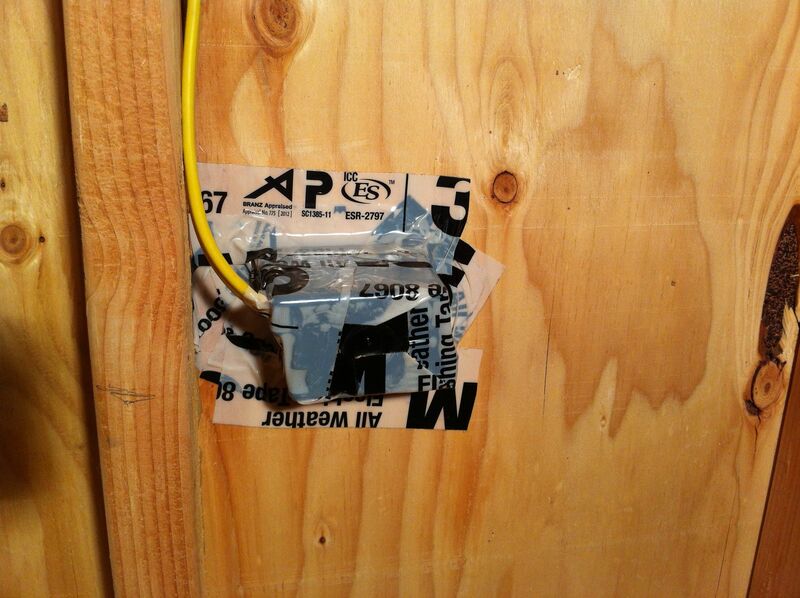 The outer plastic coating and the paper sheathing around the wires is carefully removed with a utility knife. Leave about 1/4″ sleeve of sheathing where it enters the box. I added wire connectors and pig tails to the neutral and hot bundles. I added a barrel crimp to the ground wire bundle, leaving one wire long (see next example). This long wire and the two pigtails will connect to the outlet device while maintaining a continuos circuit independent of the device. Here is a more complicated situation: the box on the left will contain two switches, one for the porch light and one for the exterior string lights. Power comes in on one cable, one cable goes to the porch light, one to the string light receptacle, and then a fourth cable takes power to the next box on the circuit. I’ve labeled all of these but won’t be able to see them once the wires are stripped and the walls are up (I did make some notations right on the ends of the sheathing where the cables enter the box so if necessary I can pull the cables into the box to figure out which is which). To make it easy, I used tape and labeled the hot wires. Since neutral wires bypass switches, I didn’t have to label them, nor the grounds. Per Larry Warner’s video, I twisted about 6″ of the grounds together and threaded a barrel crimp onto where they twist together (be sure to get the ones for copper wires). If you need to buy wire strippers, get ones like this that have a built-in crimping part; it will save you buying an extra tool just to crimp. You fit the crimping tool over the barrel and squeeze tightly. Rotate and repeat. The barrel should not be able to move at all. You can then trim down the extra ends leaving as many as you need for pig tails. Here I’ve stripped the coating off the neutral wires the amount specified by the wire connector. I’m in the process of lining them up prior to putting connector on. You want them all screwed in securely with no bare wire exposed. Here are the labeled hot wires. I should have used electrical tape but I will be removing these before I connect to a power source. With two switches, I had to make up two pig tails with two tails each. Here is one completed. Note the ground and neutral wires tucked back in the box. The hots will follow. Ideally you should cap all the ends in case the power is turned on. This completes the making up of this box. About 20 more to go! 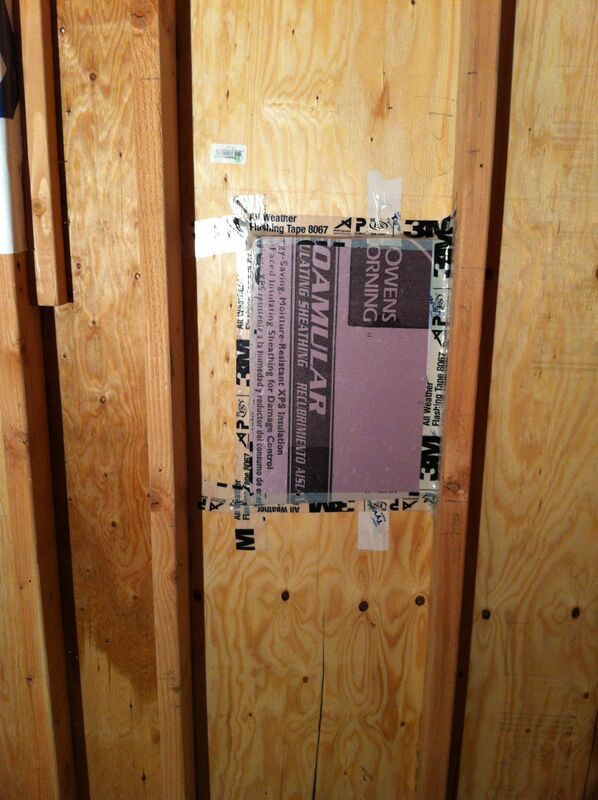 You are now finally ready to put up your wall surface and insulate. VERY IMPORTANT TIP: Don’t forget to take lots (and lots) of pictures for later reference before you close it up! As you can see from several of the photos above, I spread out a measuring tape before taking pics and also used a marker to make notes of distances to reference points I’d be able to see when the wall are up. 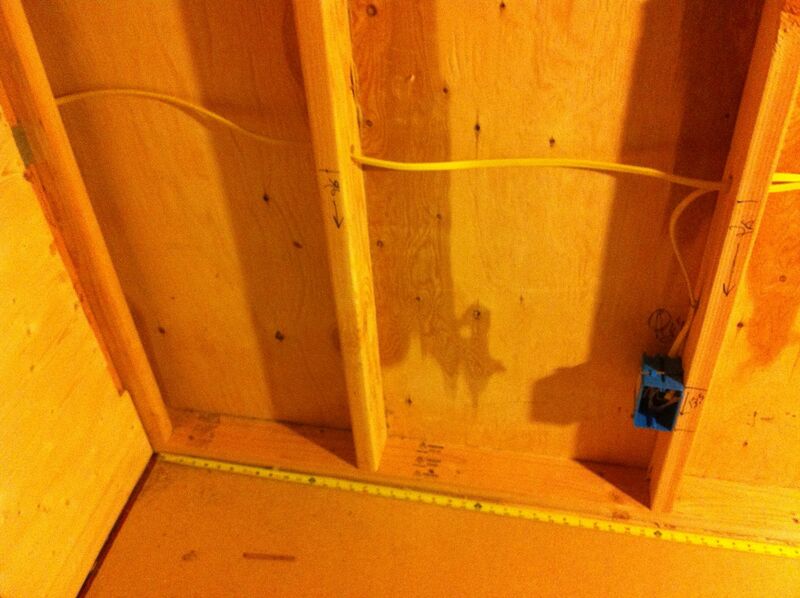 I’ve already gone back to my wiring photos several times to know where wires, studs and other framing is located. If your tiny house is on wheels, spend the extra couple bucks to get professional-grade switches and outlets (available at any electrical or hardware retail store) so that they will hold up better with vibrations of the road. Know that there are different ways are to connect wires to a device: creating a wire loop and securing it with terminal screws, backwiring with screws, push-in (stab) backwiring without screws. 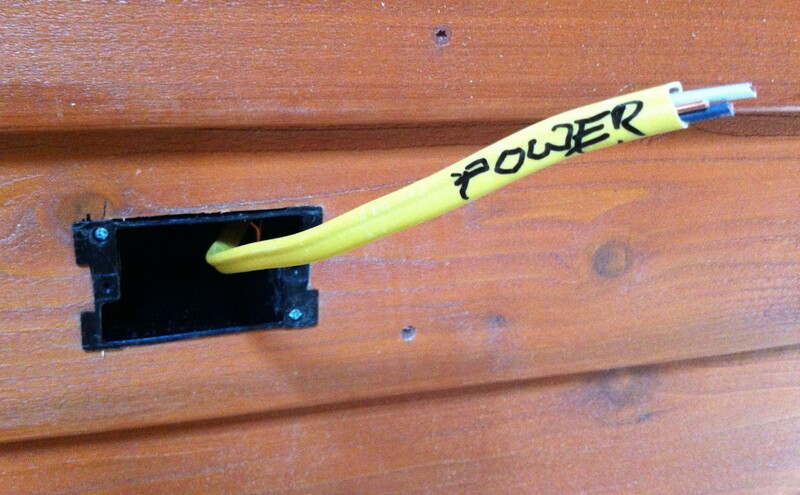 Either of the first two provide the most long-lasting connection, the last should probably be avoided in a tiny house. 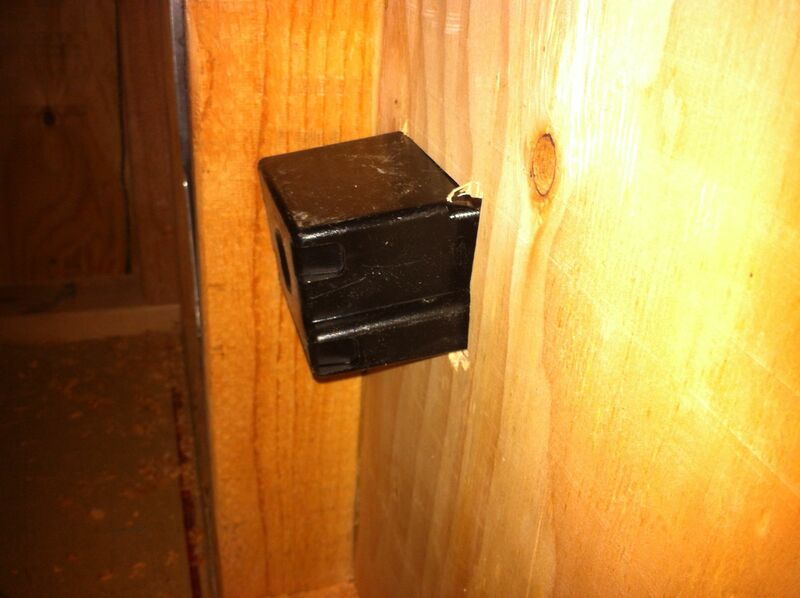 If you’re using any metal boxes (like a pancake box), research how you should connect the ground wire to the box as well as the device or fixture for safety. Plastic boxes don’t need to be grounded, just the device they hold. Many, many, many thanks to Todd Clay for his patience and guidance and giving me the confidence to do something I would have otherwise avoided like the plague. For those of you who have made it all the way to the end, you get a sneak peek of my current status (and no, it’s not done; no, I’m not living in it; and no, that’s not the final door!). I’m off to the Build Small, Live Large Summit and then I’m doing a design/build case study presentation at this weekend’s PAD Tiny House Basics Workshop, but hope to catch up on blogging soon. Naj Haus in its first home behind the barn. 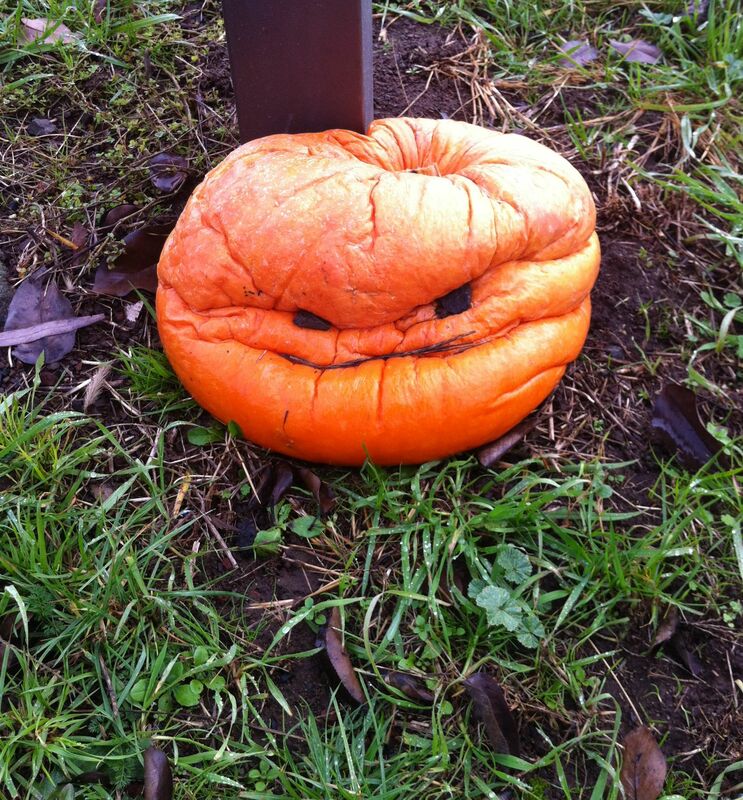 If you look closely at the porch, you can see the pumpkin a neighbor kindly gave me. Sweet Haus! Great blog! Love Auntie So proud of you!!! Thanks, Cathy! Hope I can see you soon! So Amazing! I forwarded to a friends daughter who was also wiring a tiny house Deidre Morrison, haven’t met her but her Mom Zoe comes to garden club Wonderful Achievement Kate! Great, Cath – hope it helps! Ah, I was at Build Small, Live Large! It would have been nice to meet. Your electrical work looks good. Thanks, Kjiersten. Sorry we missed each other. Amazing how many people were there! Hi Julie – thanks for bringing my attention to the broken link! I see that TinyHomes.com has changed radically from what it was when I was blogging for it and they’ve deleted all of the blog posts. Unfortunately I didn’t keep a copy of that one – my bad, especially since it was near and dear to my heart. I’ve just written to them to see if they still have it. If so, I will post it on my site and let you know, but I fear it may gone altogether. I can try to recreate it at some point but not sure when that will be since I’m behind on posts as it is. Fingers crossed it will appear! Thanks, Kellie – glad it was helpful! This is SO helpful! I am starting the process of designing my electrical system and this is a great resource. Thank you! Glad it helps – thanks! 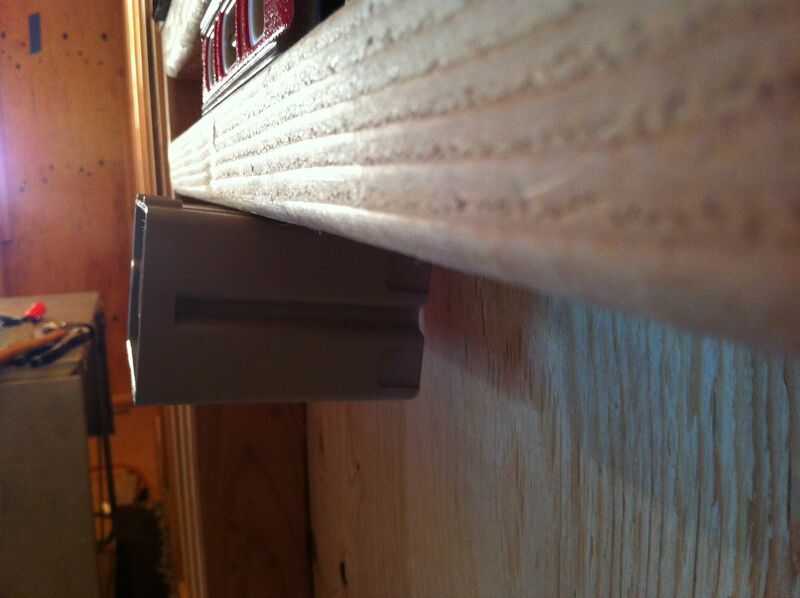 One of these days I hope to get a follow-up post on putting in the fixtures and receptacles, but it might be awhile!